This past winter here has been a bit different for me in terms of photography. I focused less on creating my more typical landscapes and tried to introduce a more human element into my images. I wanted to somehow show what it feels like to experience the amazing and surrealistic side of the Finnish wintertime. Whether it’s watching the sun go down in the middle of the day, or witnessing my city becoming hidden from snowfall, I had some fantastically memorable experiences this time around, and now I’d like to share a few of these memories with you. Here are some photos from winter. Above: My favourite local island ”Voiluoto”, sits on the frozen lake in the chilly and fresh weather. I love how soft and calm the scene appeared on that particular day. It was almost like the clouds appeared as markings from a paintbrush pressed flat onto a canvas. Above: Curves of snow sweep along the lake at sunset. I decided to put myself in the image to show the scope and vastness of the scene. It was really a beautiful moment to behold. Above: Not my most interesting photo, but I just found it to be a very simple way of showing the snowy treetops on a typical overcast and wintery day here in Finland. I really enjoy the contrast that the snow has with the darker shadows from the trees. Above: A night spent exploring under the stars at twilight. I was waiting for the sky to get darker so that I could do some astrophotography, but whether you’re into photography or not, I highly recommend having a nice winter walk after sunset. It’s amazing when the last glow of sunlight stretches across the horizon and the stars start to pop up in the sky. Just remember to dress warmly and to take precaution when venturing outdoors, especially on the lakes. 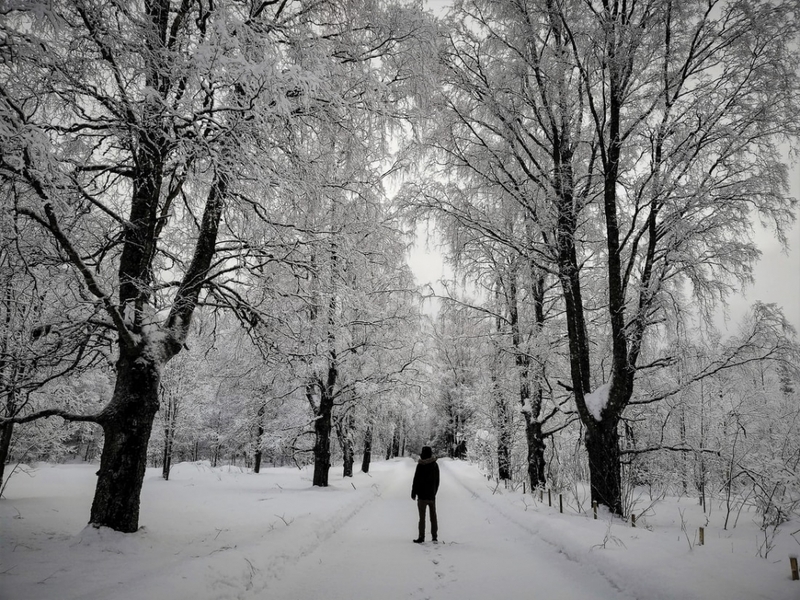 Above: In this image I wanted to recreate the beautiful sense of mystery that the Finnish winter scenery can provide. The frozen lakes and night sky can make a great combination for photography, or even if you just want to experience the other-worldly atmosphere without a camera. Above: There was one particularly stormy day here in Joensuu. The snow was coming down like crazy and the wind was blowing like mad. This image was taken just outside of the city, showing someone skiing through the stormy conditions. I found this stormy weather to be fascinating, so I sheltered myself under a tree, set up my tripod and took this shot. Above: Another moment venturing outdoors. The winter weather can occasionally be so wintery that it conceals everything in the distance, making for some awesome and simplistic photography. Just to experience it feels like you are in a dream, or up in the clouds! Above: Sitting on the lake one night with my lantern. The air was incredibly frosty and refreshing. This image would probably round-up my experience over the last season best. The adventure, moody and mysterious darkness, crisp air and spectacular snowy landscapes all combined to make it a winter worth remembering. Hope that you all had a great snowy season and that you have a fantastic spring! See you out there in the nature. 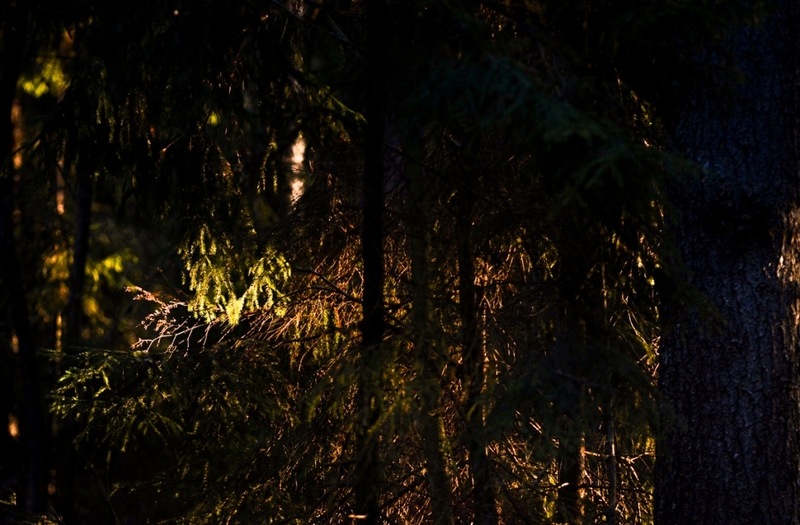 Deep in the forests of Eastern Finland, there lies a peaceful and unspoiled place. Here, one can find snow that goes knee deep and frozen trees that tower all around. 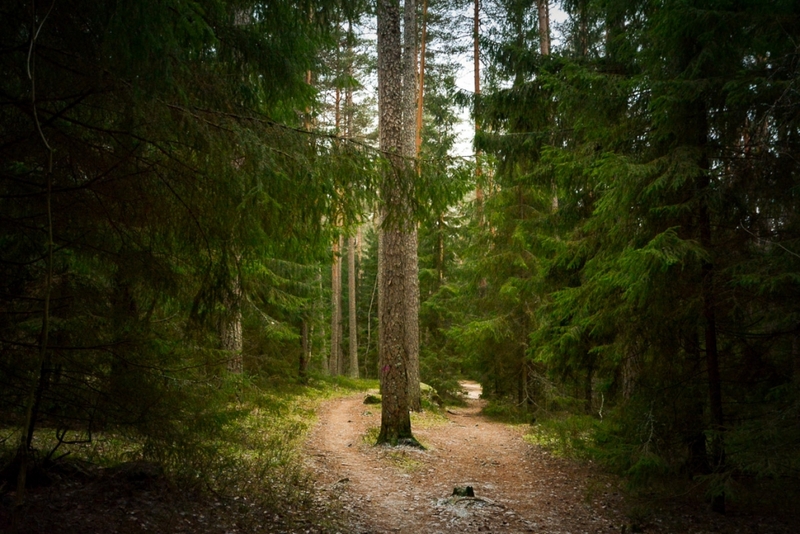 It is totally quiet here, and it is possible to be in harmony with nature while walking through these woods. 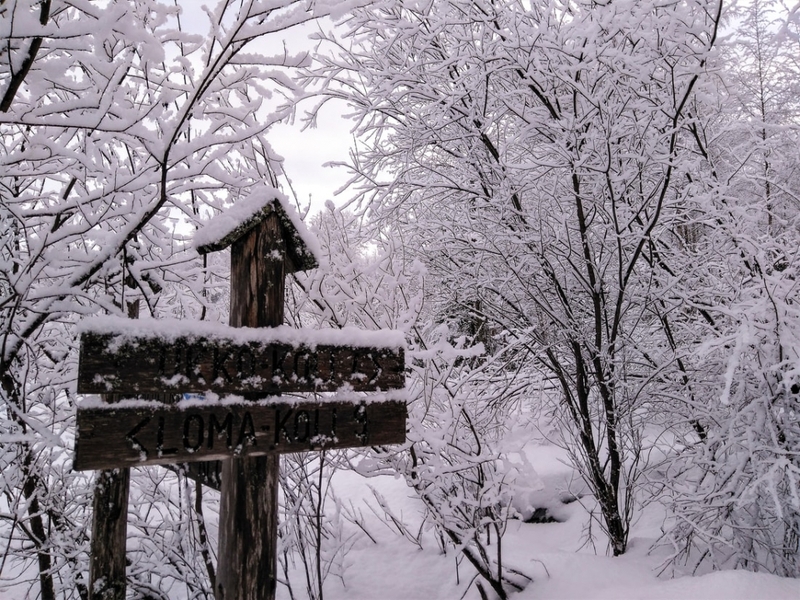 This place is Koli National park, and last winter I was lucky enough to explore this snowy realm. 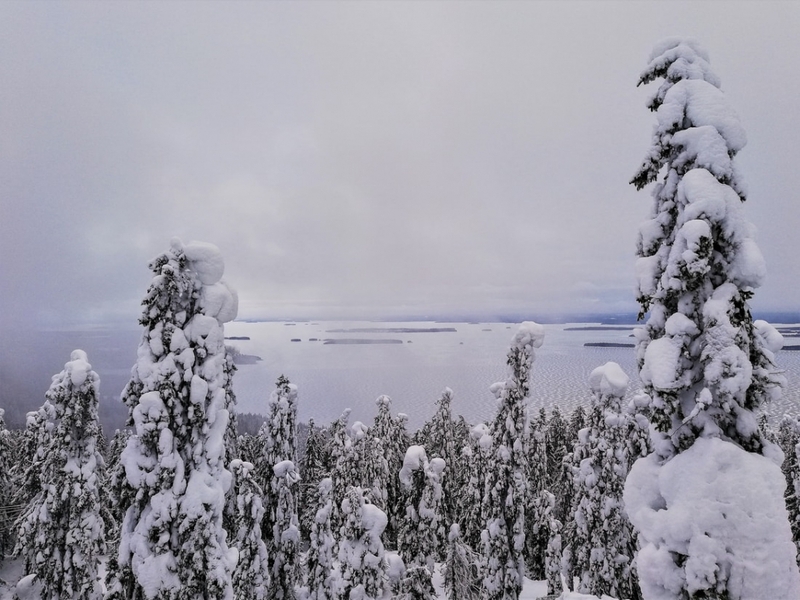 I have put together a 12-photo album of this adventure as I make my way to the Ukko-Koli, where one can see one of the most spectacular views in all of Finland. 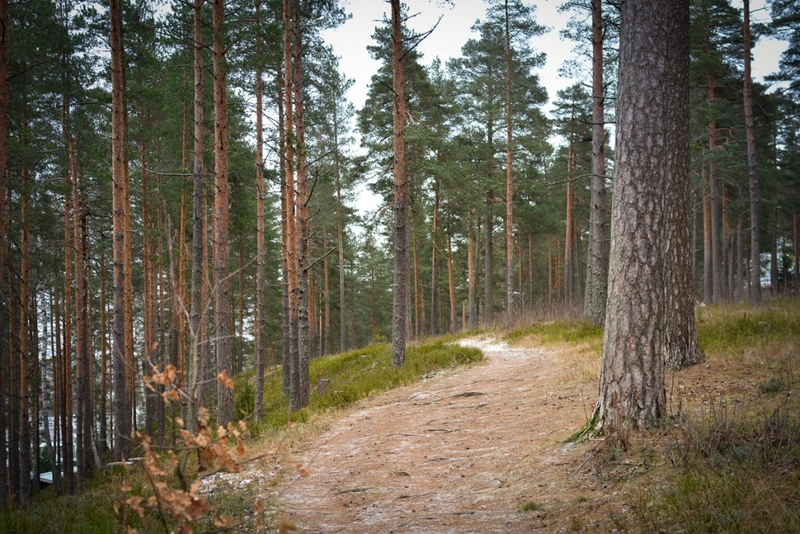 The hiking trail is the forest walk which can be taken from the Koli village (Kolinkylä) to the lookout at Ukko-Koli, overlooking lake Pielinen. The first thing I was greeted with was fluffy snow peacefully adorning the branches of the many trees. 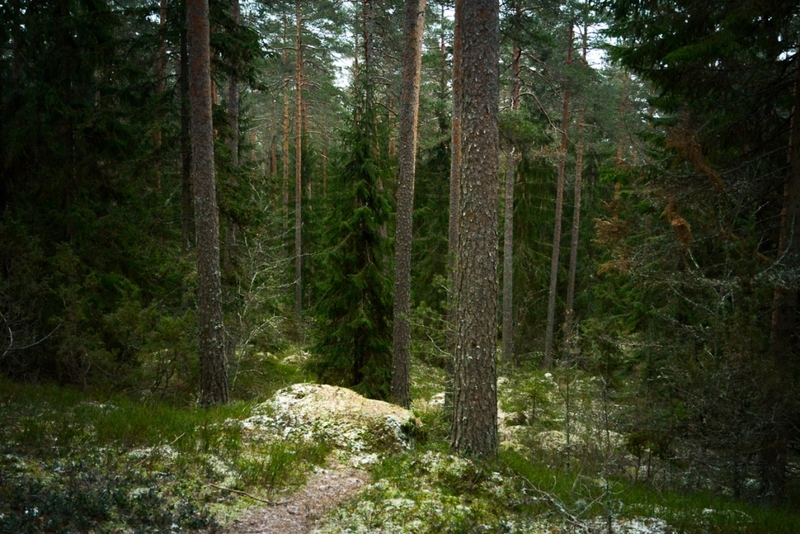 Old spruces and birches grow in these protected forests. I was sinking knee-deep into the snow with every step, but it made for a more memorable adventure. There is no better place to be mindful of the surroundings and enjoy the delicacy of nature. Koli has inspired artists for centuries. 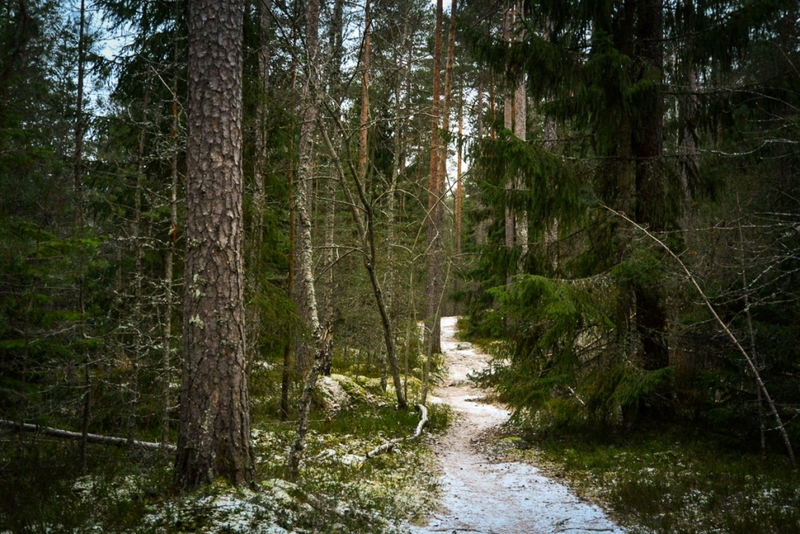 A lonely sign could be found along the hiking trail, guiding the way through these mysterious white forests. 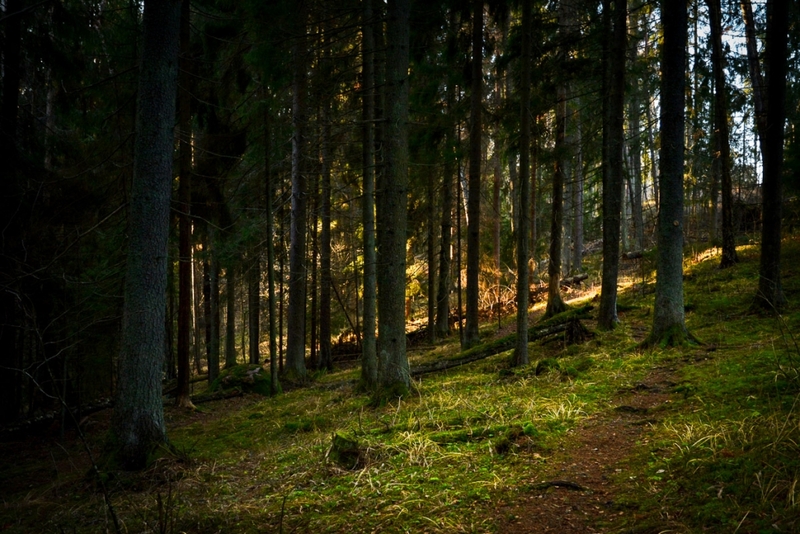 Walking through these peaceful landscapes was indeed very calming and relaxing for the mind. The walk is also about the little things, such as the fresh cold air. With every passing minute on the walk, the views get better and better. Even a ski area can be found here. Then, at last, I reached the summit, where the iconic ‘National view of Finland’ can be found. It was an unforgettable sight. 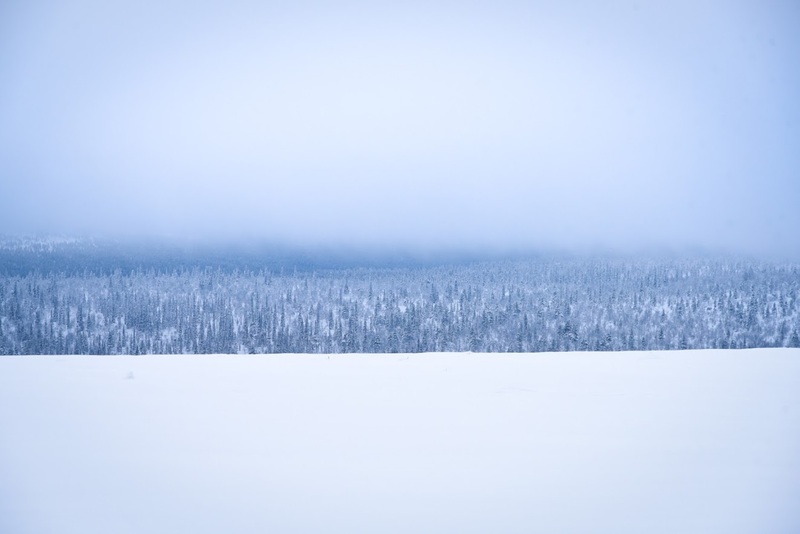 The lake Pielinen lies ice-covered in the distance, as misty clouds cast their shroud over some of the frozen pine woods. Once, long ago, great glaciers shaped these landscapes. Back then, the land was permanently frozen under glacial ice caps which didn’t melt for thousands of years. Some of the greatest trees can be found here. They span from the Atlantic to the Pacific coasts in what is known as the Main Taiga, the world’s largest ecosystem. 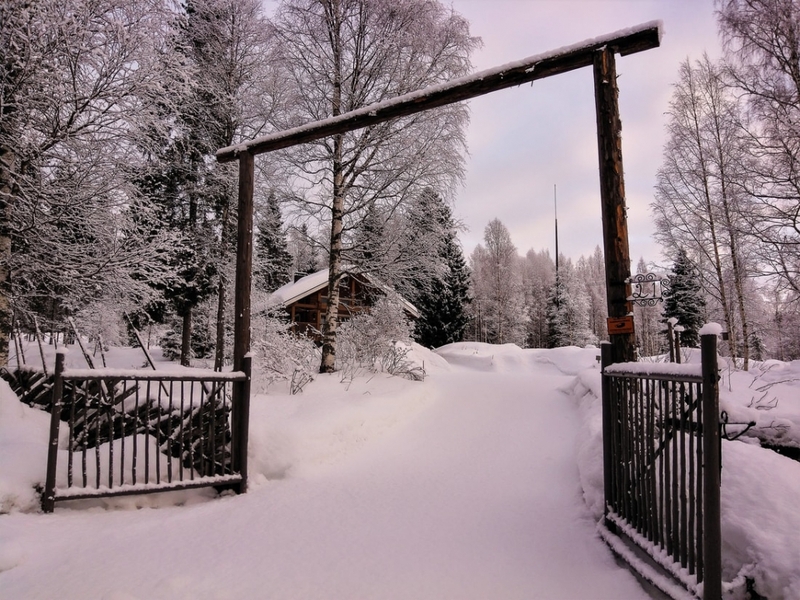 On the way back down, I found a traditional cozy winter cottage with its gates lying open in welcome. And finally back again at my homely accommodation, Kolin Ryynänen, a traditional wooden lodge. 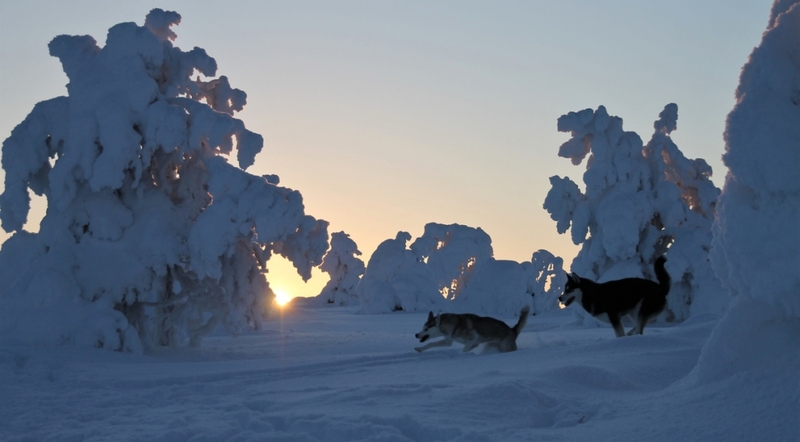 Every year, the fells of Saariselkä are covered by a layer of fluffy white snow. This ski centre, the northernmost in Europe, boasts a myriad of beautiful slopes, fun sledging hills, well-maintained ski trails and guided treks, guaranteeing a memorable holiday. 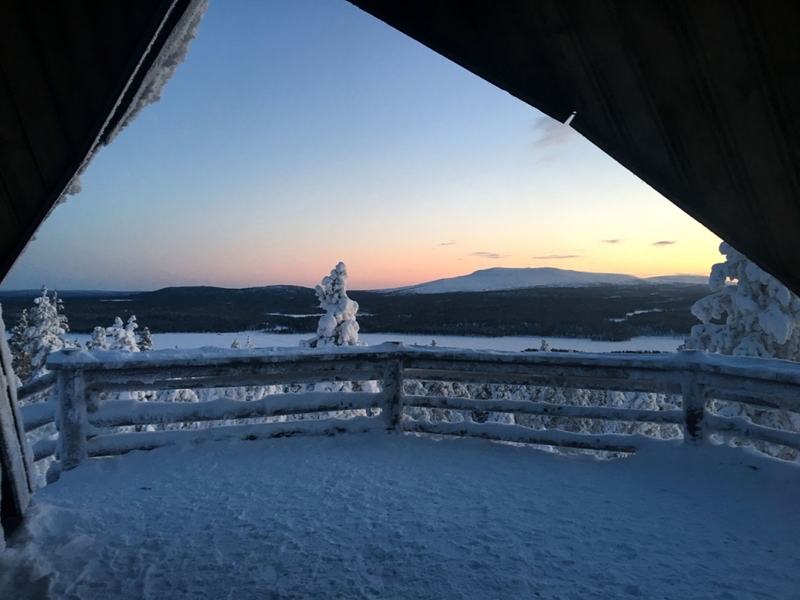 In Saariselkä, the ski season is guaranteed to last from November to May – perhaps even longer, as in the past the ski centre has opened its doors on three days in June to offer its visitors the memorable experience of skiing on slopes lit by the midnight sun. 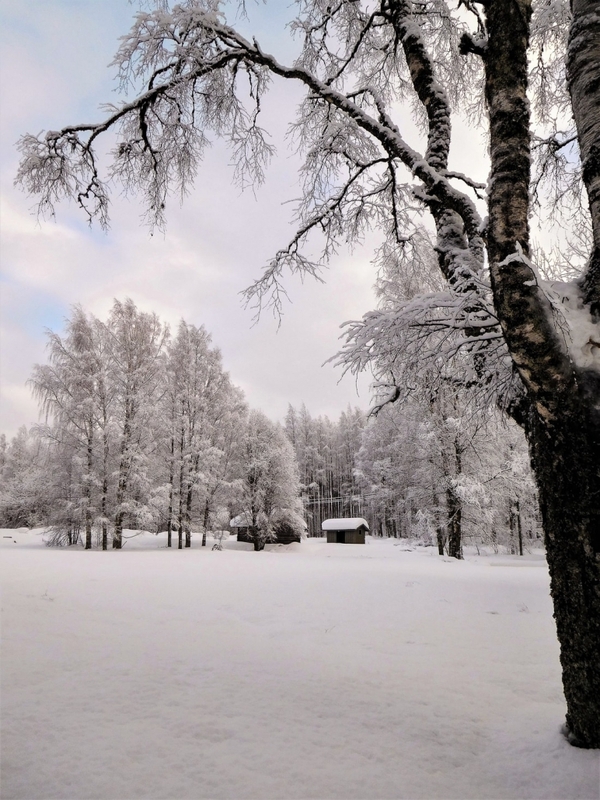 The natural snow in Saariselkä is of excellent quality and lasts until late spring on the slopes between two fells, where beginners can find suitable courses and more experienced skiers can try their hands at tricks. 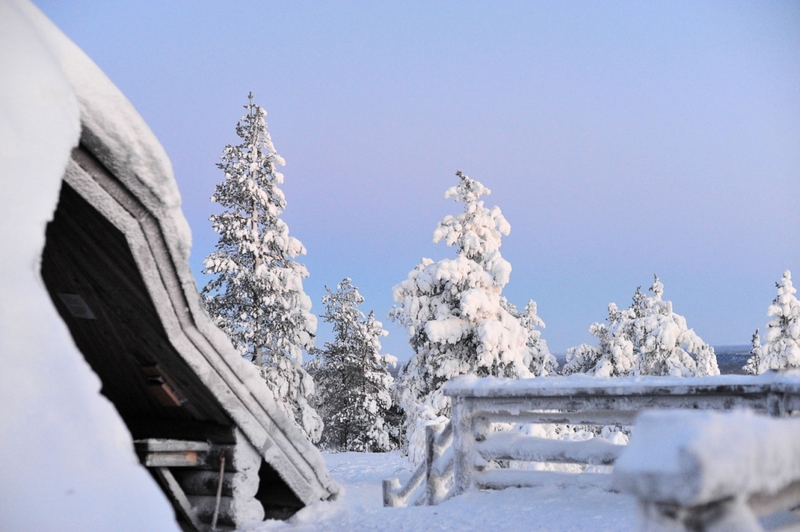 Saariselkä also boasts two extra long sledging slopes, one of which is the longest in Finland. 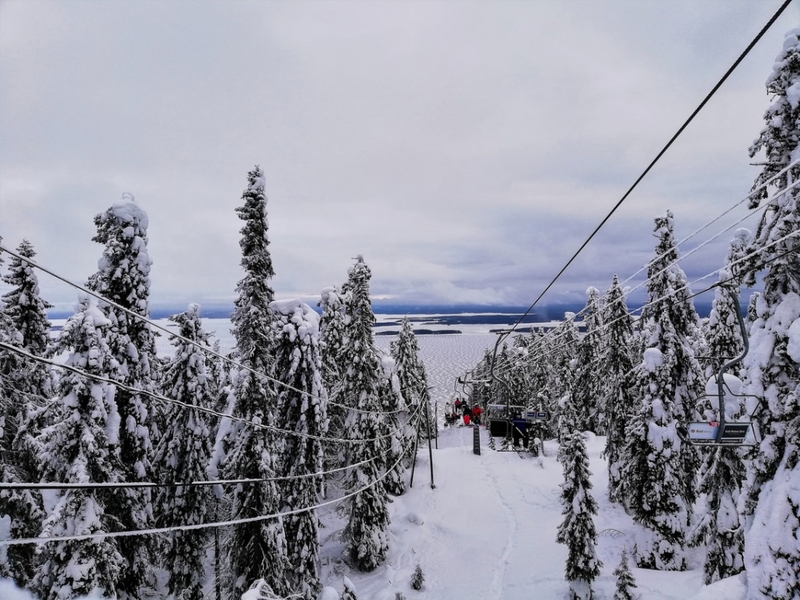 On this 1,800 metre run, daredevils can whizz down from the top of Kaunispää all the way to the lower chairlift terminal. The toboggan slope is illuminated with aurora-inspired light art. In December the sun never rises in Saariselkä, but the ski centre’s well-lit slopes guarantee that the winter fun doesn’t have to stop. 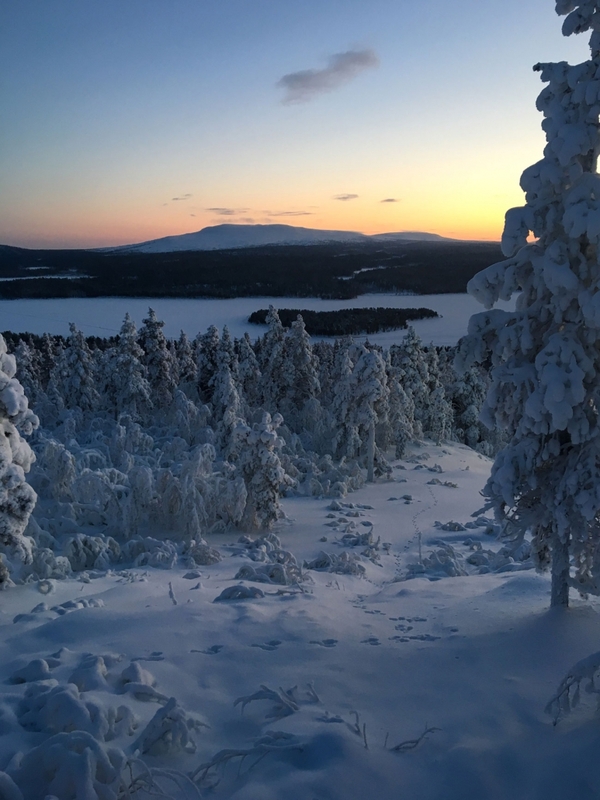 The polar night brings its own magical atmosphere to Saariselkä – and the arrival of spring offers another enchanting experience when the days get longer and the April sun glistens on the snow like a thousand diamonds. 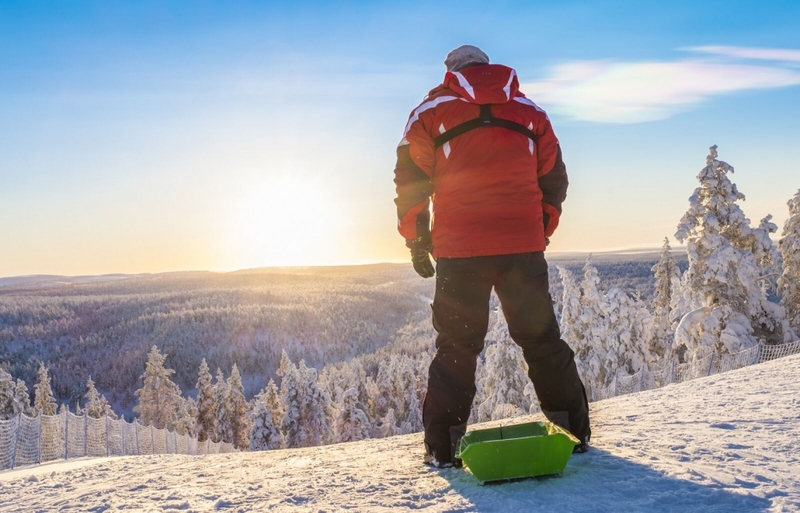 Even for visitors who have never experienced snow before, learning downhill skiing, snowboarding, sledging and cross-country skiing is safe and fun with Ski Saariselkä’s professional instructors. To ensure safety, the beginner slopes and other practice facilities have been designed with novice skiers in mind. 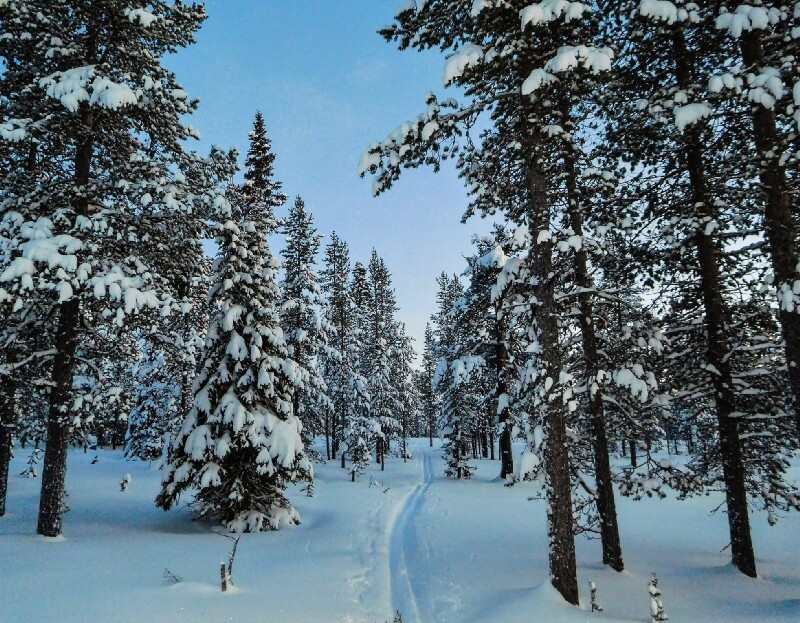 The ski resort of Saariselkä boasts about 200 kilometres of well-maintained ski trails, 34 kilometres of which are illuminated. 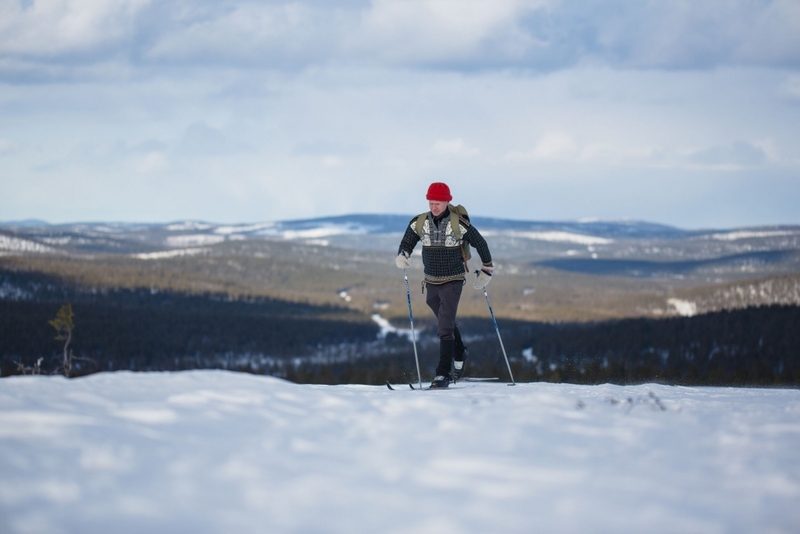 With its vast wilderness area, Urho Kekkonen National Park, situated a stone’s throw from the ski centre, offers great opportunities for cross-country skiing and trekking. 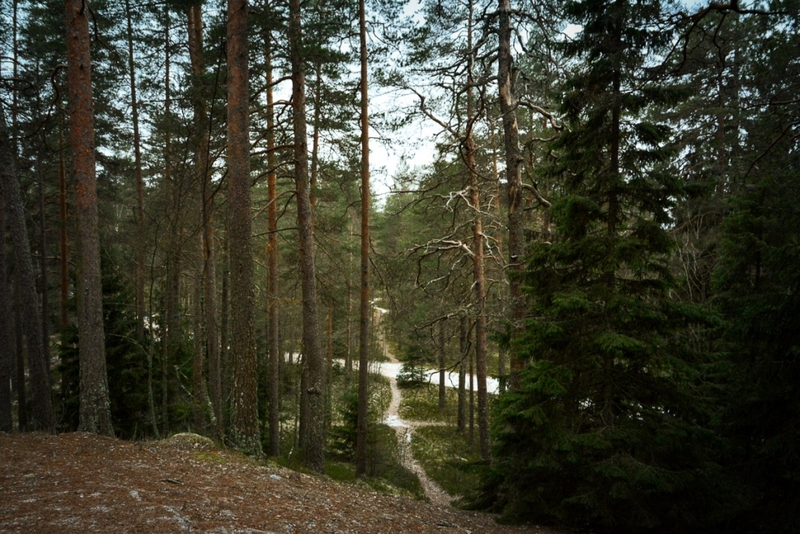 A map of the ski trails is available online at infogis.fi/saariselka. Playing in the snow comes naturally to children, and the unspoilt, snowy forest often brings out the inner child in many adults too, who find themselves building snowmen and making ‘snow angels’. For some, on the other hand, snow may be such a novelty that they feel slightly nervous about the unfamiliar conditions. 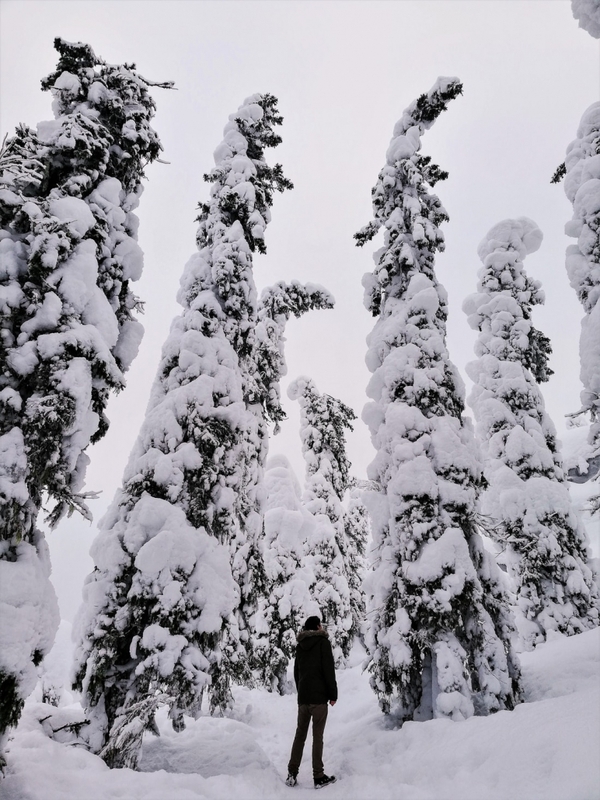 For this reason, Saariselkä’s winter safari organisers often pick up their customers from the hotel or Saariselkä centre and kit them out in warm snowsuits. 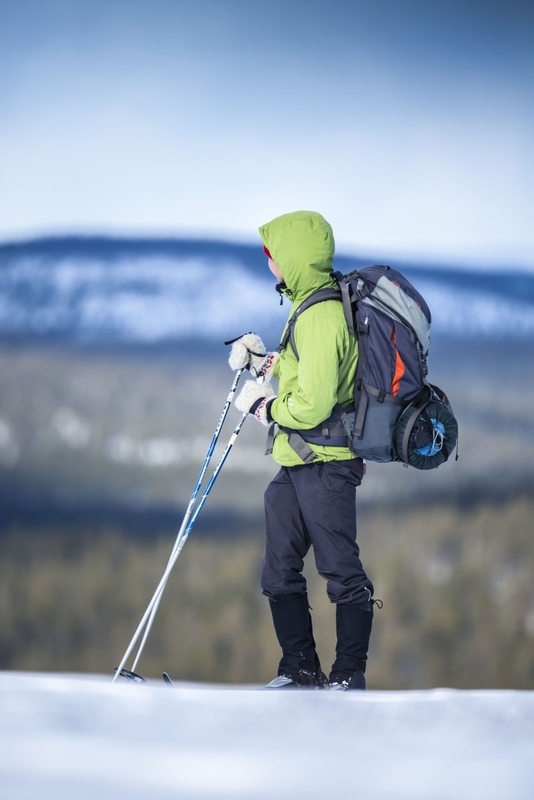 They also rent outdoor gear such as snowsuits, skis, snowshoes, sliding snowshoes and sleds to DIY travellers, as well as offering ski waxing services. 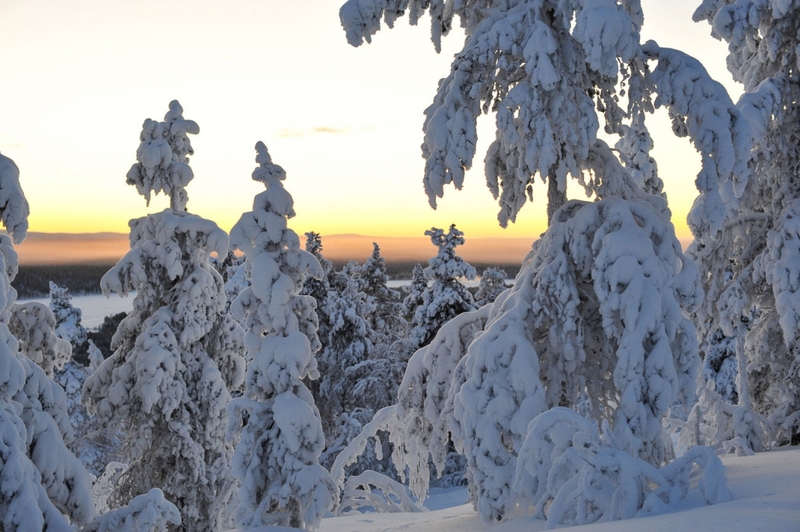 Shops in Saariselkä sell a wide range of winter clothing, from socks and thermal underwear to hats and outerwear. 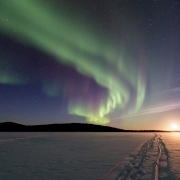 Lapland Safaris’ most popular excursion, the Aurora Borealis Safari, takes visitors on a hunt for the Northern Lights half an hour’s drive, or an hour’s snowmobile ride, away. Situated by a large lake, the viewing spot, far from any artificial lights, has been selected to maximise the chances of seeing this incredible natural display. Also fat bike treks are organised along snow-covered forest roads to a frozen lake for a spot of ice fishing. 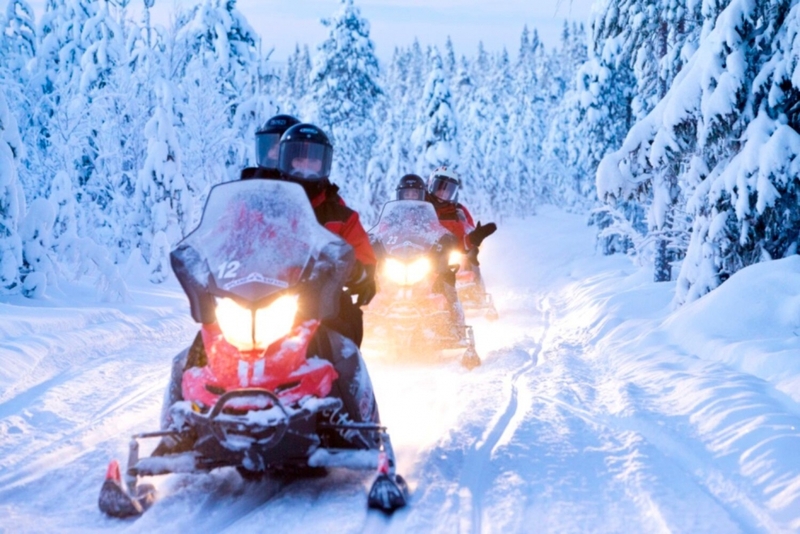 Snowmobile safaris offer adventures in the forest and on the fells. Northern Lights Village also offers a variety of winter activities, including tuition in cross-country skiing and photographing the Northern Lights. Children over the age of three can put their skills to the test on a children’s snowmobile. 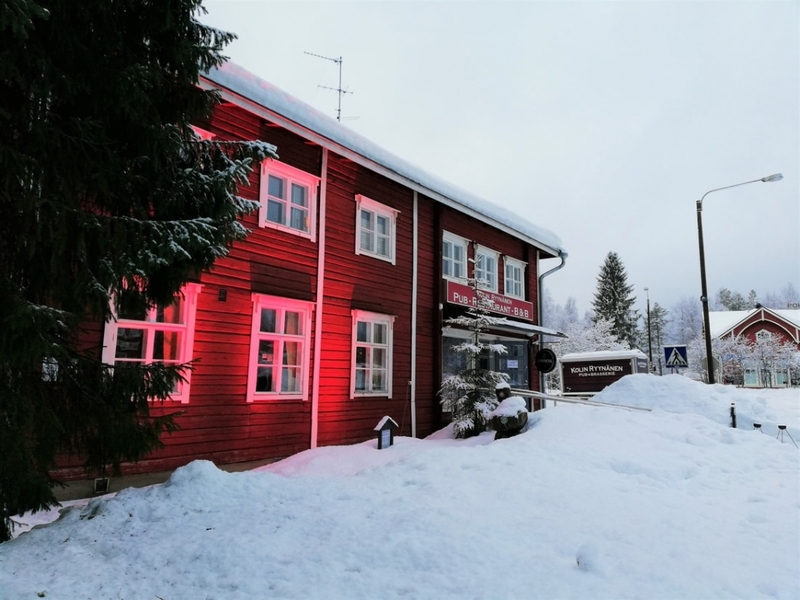 In addition to an ordinary restaurant, the hotel boasts a snow restaurant where diners can sample drinks and savour á la carte dishes while seated on ice benches covered with reindeer rugs. 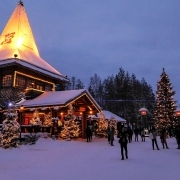 The hotel has its own reindeer farm, and visitors can discover a world of Arctic adventures right on the hotel’s doorstep, including snowmobile, reindeer and husky safaris. 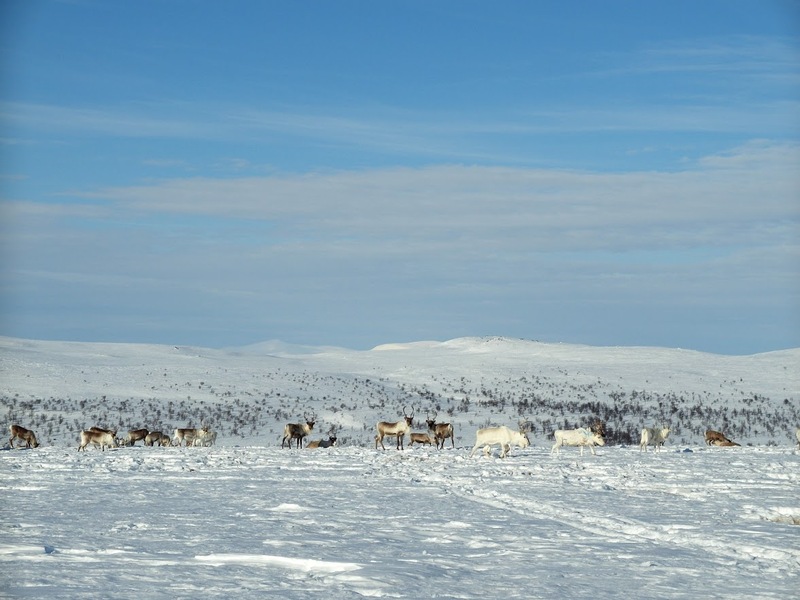 Joiku-Kotsamo Safaris, run by a local Sámi family, offers a variety of reindeer safaris. Once the ground is covered by a layer of snow, reindeer-pulled sled rides are arranged every evening. 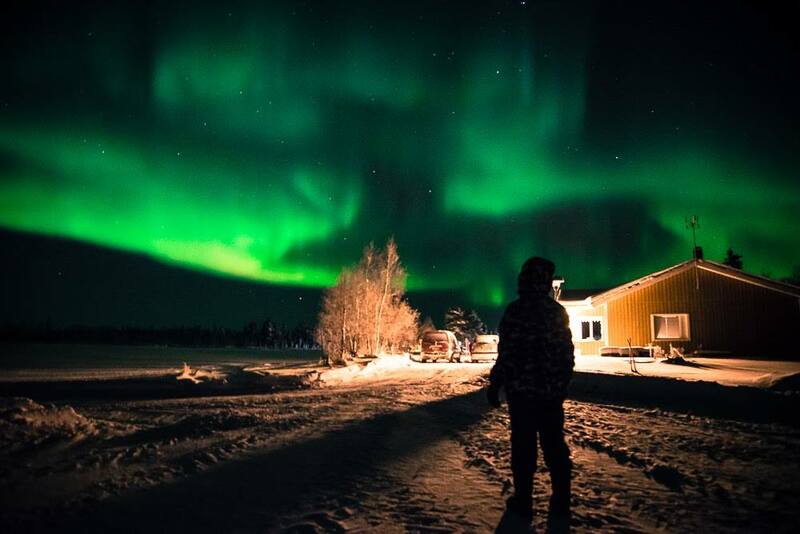 On these two-hour outings, you can scan the skies for the magnificent Northern Lights before stopping to warm up by a campfire with some hot drinks. During the day, the reindeer safaris weave their way through snowy pine forests. In December, when lakes get their ice cover, fishing on a frozen lake makes for a memorable experience. After riding to the lake on a snowmobile, you can fish for Arctic char and grayling through a hole cut in the ice. Your catch is transformed into a mouth-watering fish soup, washed down with coffee brewed on a campfire. In the daytime, snowmobile safaris, lasting either two or three hours, take visitors to admire the majestic fell scenery, while in the evening the goal is to make an Aurora Borealis sighting. 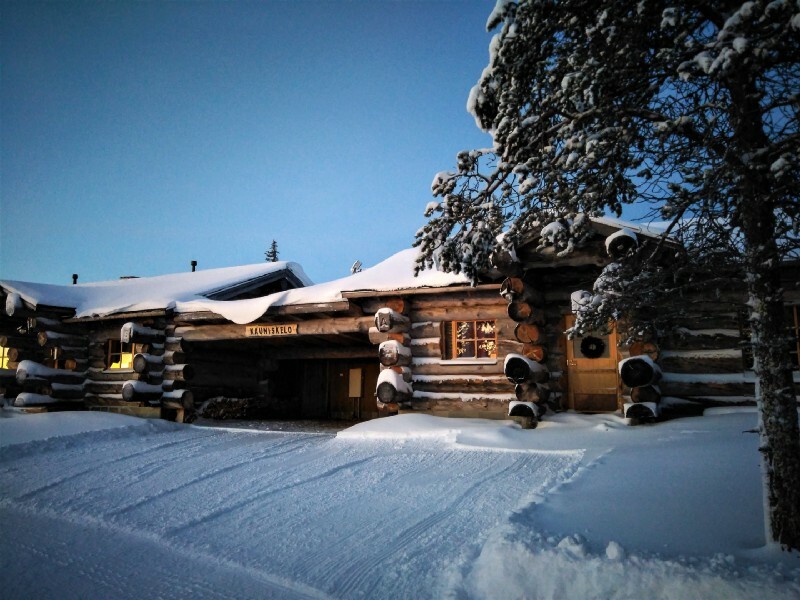 The reindeer farm also has a traditional Lappish log cabin where you can enjoy authentic Sámi delicacies: smoked reindeer, salmon cooked on an open fire and Arctic berries, with the experience completed by Sámi yoik and folktales. Advance booking is required. 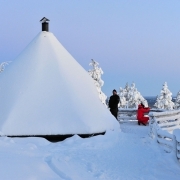 Snow safaris arranged by Lapin Luontolomat take visitors through vast northern forests to the shore of a lake, known for its clear water, where they are welcomed by a log cabin, sauna, hot tub, lean-to and a fisherman’s cottage. This spot under starry skies makes for an idyllic setting for ice-fishing and enjoying a candlelit meal by a campfire, while keeping an eye out for the Northern Lights. The open fire is also perfect for grilling sausages. 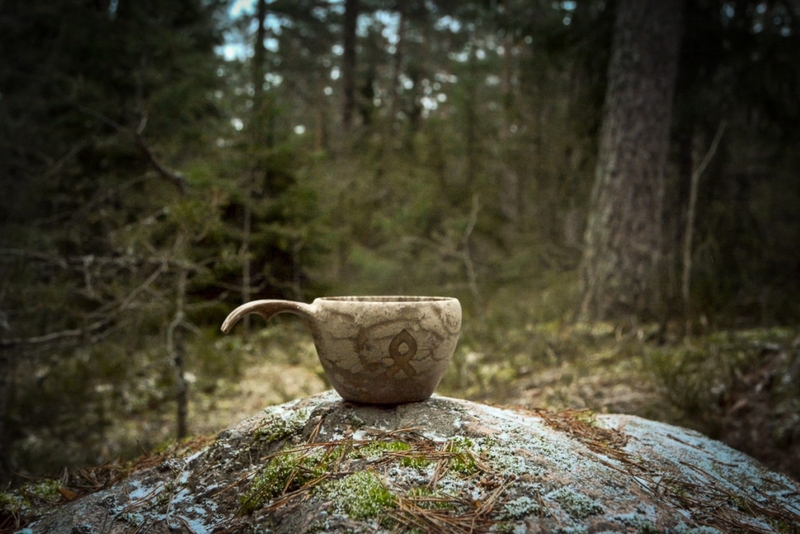 Local delicacies can also be savoured at the cabin, which seats 50 people and serves lunches and dinners with yoik as an accompaniment. The place, though far from urban noise and artificial lights, is easy to reach by car and snowmobile. For those looking for a real adventure, a longer snowmobile safari to the Russian border is an ideal choice. 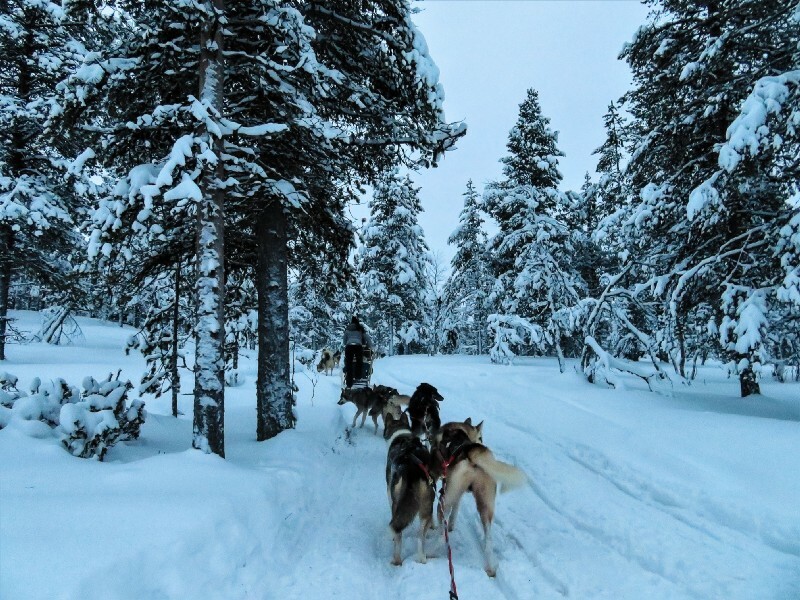 With its wide range of activities, Saariselkä offers something for everyone – whether you are in search of action-packed adventures or relaxation amid Lapland’s magical landscapes. 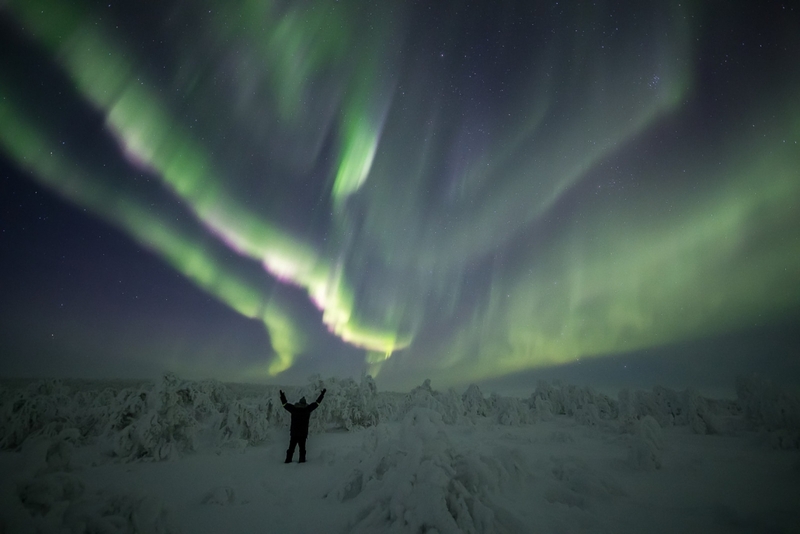 I am going on my eight consecutive winter chasing the elusive Aurora Borealis, or Northern Lights, all around Inari, in the very north of Finnish Lapland. 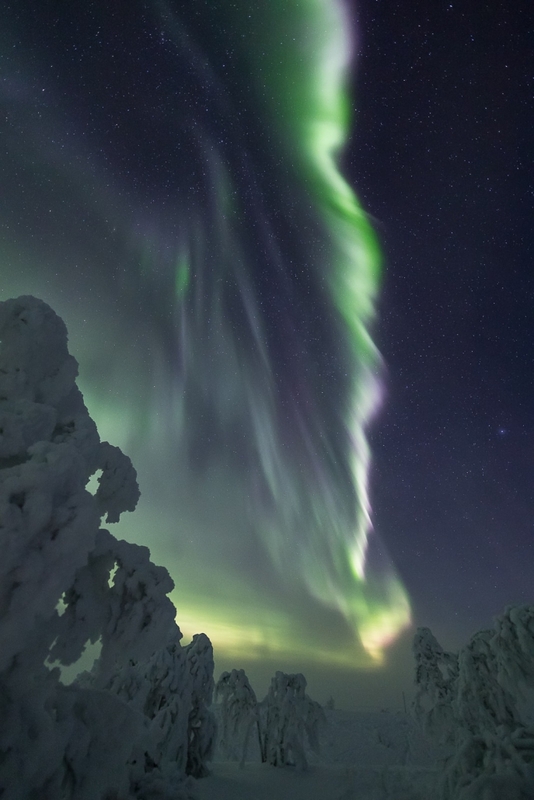 Sure, I have also seen the Aurora in Norway and even Greenland, but every single winter I am drawn back to Inari for photography and to help people enjoy this magnificent show of nature. I am often asked “why do you always go back to Inari?” or “why don’t you try somewhere else?”. I always wanted to experience the northern lights, but at first the only thing I knew was that I had to go somewhere north. But where north? So after a long process and weeks of research I set my mind on Inari. The Aurora Borealis appears under a huge doughnut shaped ring that is centred on earth’s magnetic north pole. Without getting too much into the science, this means that if you travel to a location right under the “doughnut”, or Aurora oval, you maximise your chances to see the northern lights, even when the activity is very low. 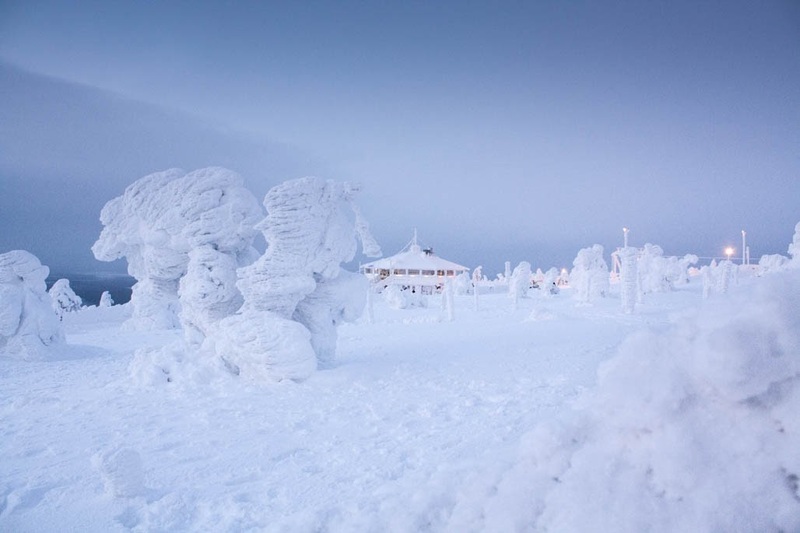 Inari is located at 68°50’N – 265 km (165 mi) north of the Arctic Circle. 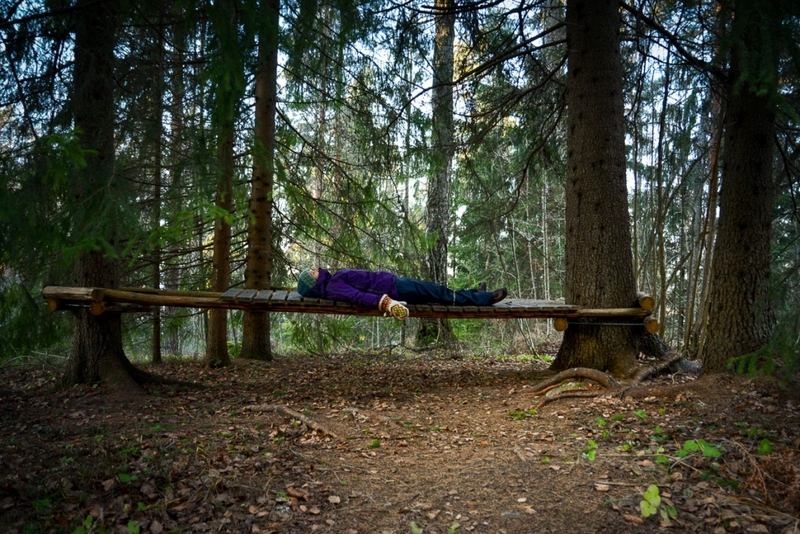 This positions Inari right under the ring, almost guaranteeing to see some northern lights on a clear night. This probability based on scientific facts is the most important criteria in my decision to visit Inari and return there so often. 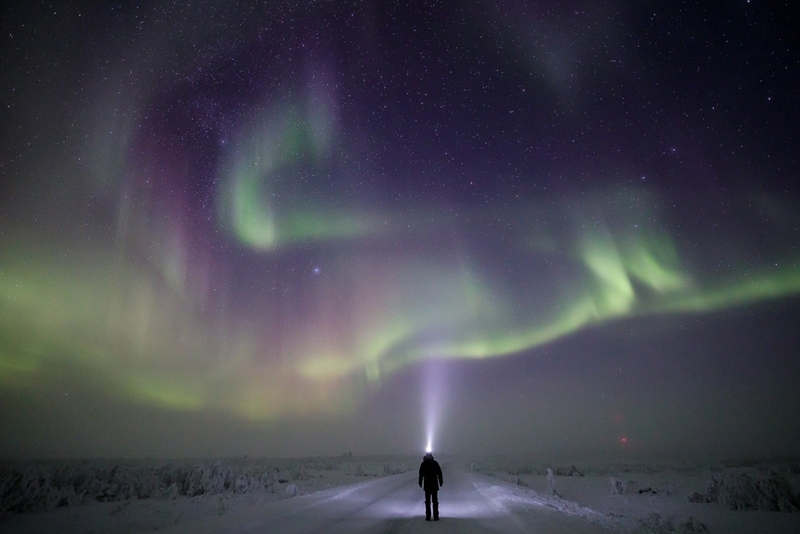 When you want to see the northern lights, you go “Aurora chasing” with a guide or your own car. In reality, it would be more accurate to say that you are chasing the good weather as you cannot see the Aurora if you are under clouds. 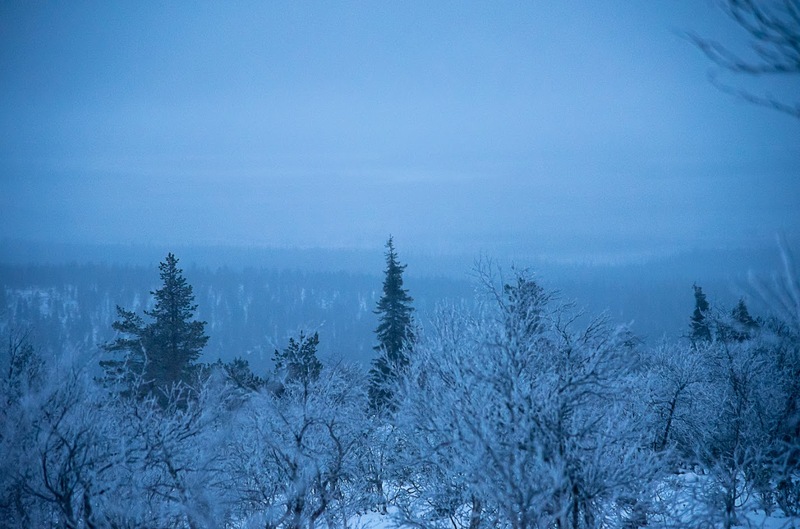 Although I am no meteorologist, my personal opinion is that there are often clear nights around Inari. 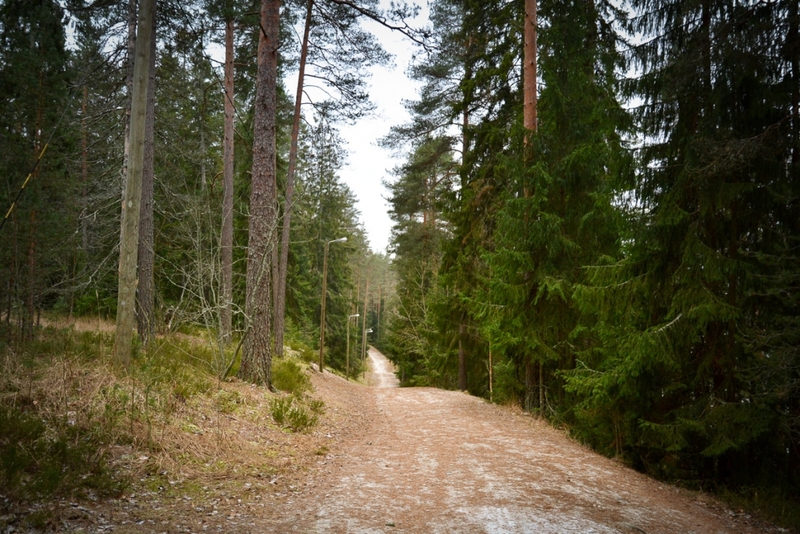 However, if this does not happen during your stay, don’t worry: there are several roads radiating from Inari to all directions. You might even end up on the shore of a fjord in Norway! This makes it very easy to chase the good weather. Some words of caution: when you are driving yourself, be careful in difficult weather. You also have to be careful of reindeer and elk that are frequently standing or sleeping right in the middle of the road. If you don’t have experience with winter driving, or just want to relax and not worry about anything, then hiring one of the several professional guides is a safer idea. Shutter speed: this one depends on the brightness of the Aurora. Start at 10 seconds and move up or down depending on what you see on your camera screen. Focussing is the hardest thing to do at night. If you don’t manage to focus on stars, ask someone to stand about 30 meters from you with a flash light, and use auto focus on this light. Then switch to manual focus (MF) and don’t touch this setting anymore. Tip: practice with your cameras before going out for Aurora, so that you know where all the settings are. A frequent question is how often it is possible to see the Aurora. On a clear night, it is almost always possible to catch at least a glimpse of the northern lights. It might not always be some intense colourful outbursts, but if you are lucky you will see some light dancing in the sky. That’s why I always go out at night if there’s even the slightest chance to find clear sky. My Aurora chasing usually begins in the early afternoon, when I browse through several weather forecast websites, and exchange text messages with other Aurora chasers all around the region. With this information I make an action plan and will usually start driving around 7 PM. I have often witnessed Aurora in the very early evening, so I like to be in position as soon as it’s dark! During the polar night, this can even be much earlier, like 3 PM or 4 PM. Once in position, the waiting game begins (unless the Aurora appeared unexpectedly much earlier while still on my way!). Clouds might disturb the view to the stars, so I check the weather forecast once more, and call my friends again to have the latest update of their location. If needed, I will drive again. The Aurora starts dancing in the sky. I am in my element now. I know how it moves, I anticipate its movements, I can be ready to take the best possible pictures. Sometimes it surprises me, actually quite often, and this is why I never get bored. I always return, and participate in the dance. You might even hear me scream “wow” or something in French. I take photos of my happy guests under the Aurora. I can never decide when to start driving back, because I know that another outburst can always happen. But I know that the Aurora will be there again tomorrow, and we finally drive back to the hotel, with beautiful images in our memory cards, and amazing memories in our minds. What´s the best part about owning huskies? 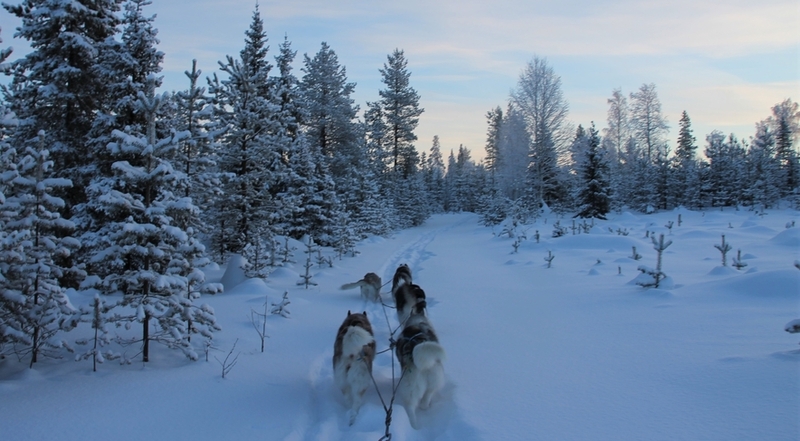 All the mushing fun you can have with them of course! And this is exactly what we do almost every day. My huskies are pure breed Siberian huskies, a well known sleddog breed that originated from an old tribe in Siberia. They have a very beautiful appearance and they love to pull! We live in the perfect spot in Luosto. We can start our sledding adventures from our backyard, from where we can reach lot of trails. 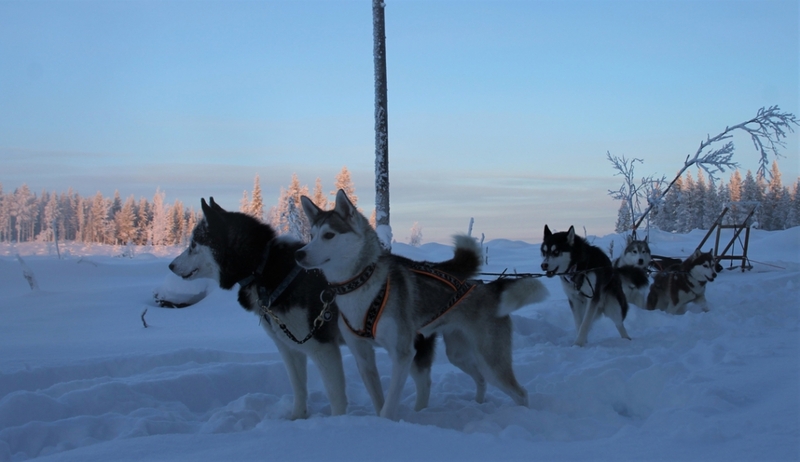 Sadly I don’t have enough huskies (in my opinion), so usually my friends huskies come along with me when mushing. Or we make two teams and have a fun time together exploring the trails with our huskies. 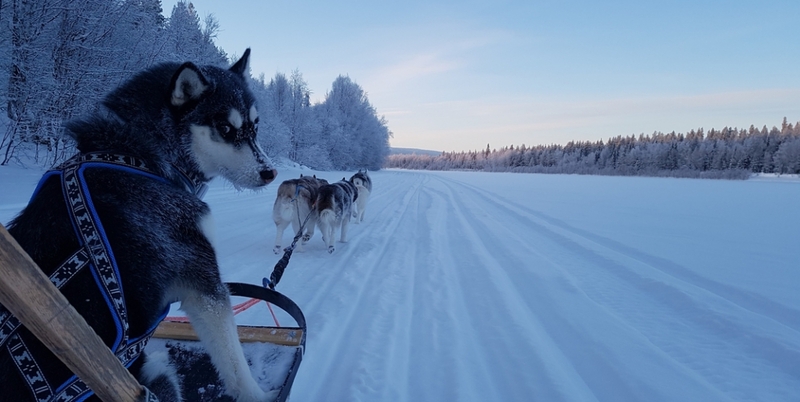 During the drive I just enjoy the amazing view that the backcountry of Luosto has to offer, look at how the dogs are working and all of us love every minute of it! One of my dogs is not of age to run the whole trail yet, which means that I sometimes need to get creative. When it’s unsafe for him to run, he comes to sit in the sledge (which goes with a lot of protest sometimes). Otherwise he is just running freely along with the team. 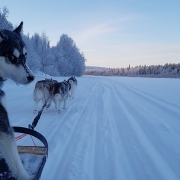 When sitting in the sledge he can still learn and see what it’s like to be a sled dog. Everyday on the trail we learn something new and see the nature in different circumstances. Sometimes we get sunshine, sometimes heavy snow and a lot of days freezing cold. But never will we complain. We just enjoy our time together when we are doing what we are born to do! And besides working we just have a lot of fun together exploring the rest of the world! We are lucky to live in the most beautiful part of it. In the village Hetta in Enontekiö there is a nice walking route up the hill Jyppyrä for a day trip if you are in the area. The route starts from the yard of the Fell Lapland Visitor Centre which is located just a few minutes walk from the center of Hetta. In winter this route is beautiful and an easy choice if the snow is too soft and deep for other places. You can also rent snow shoes from the visitor center and try out this fun activity! The route is not too long, around one kilometer, but it is really steep, so you have to make some effort. But the view up the hill is really worth it. 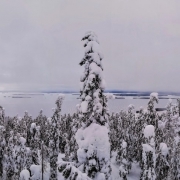 You will be able to see all the way towards the great fells of Pallas-Yllästunturi National Park and the snowy trees look amazing! 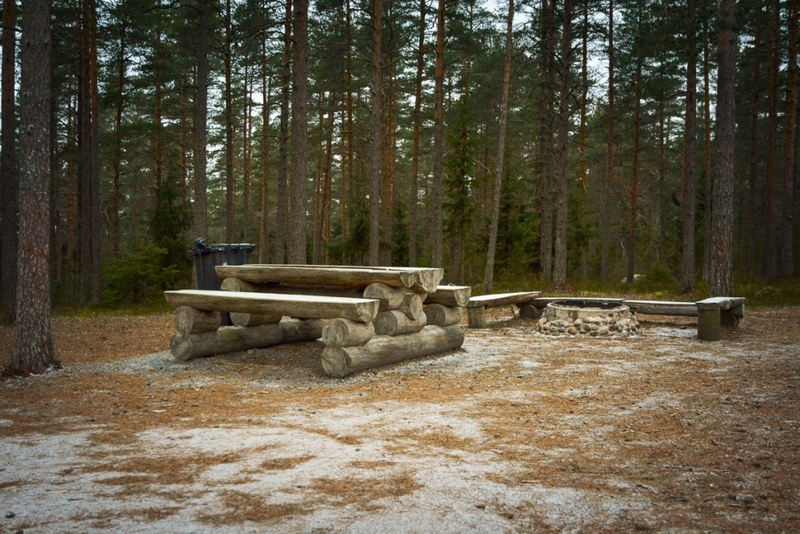 Up on the highest point there is a traditional open shelter with a campfire spot, and it is possible to grill food there. At the entrance there is a lookout, but if you climb a little bit more and go behind the kota-shelter, you will get an even better view. 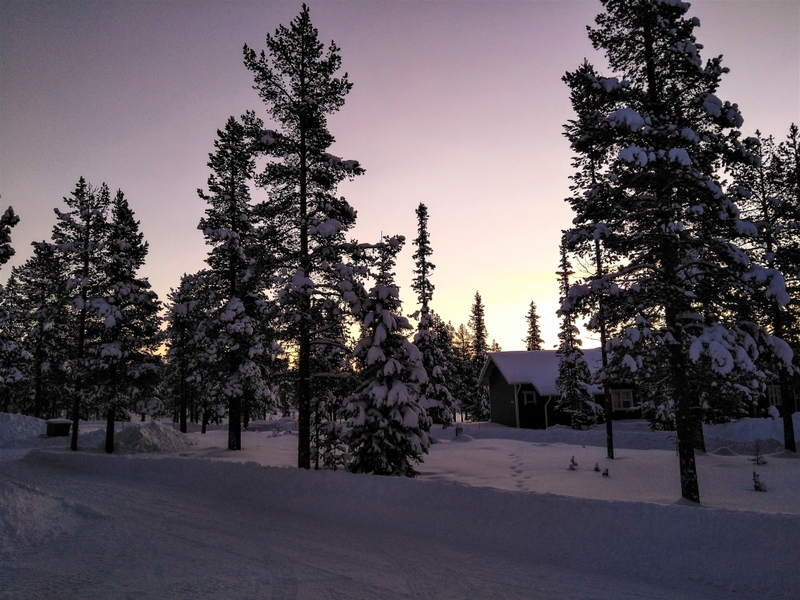 The day is short in Lapland during the winter, but the colors of the polar night are amazing. And what could be better than to climb high to watch a beautiful sunset? The best winter days are ahead now that the spring comes with the sunny days! 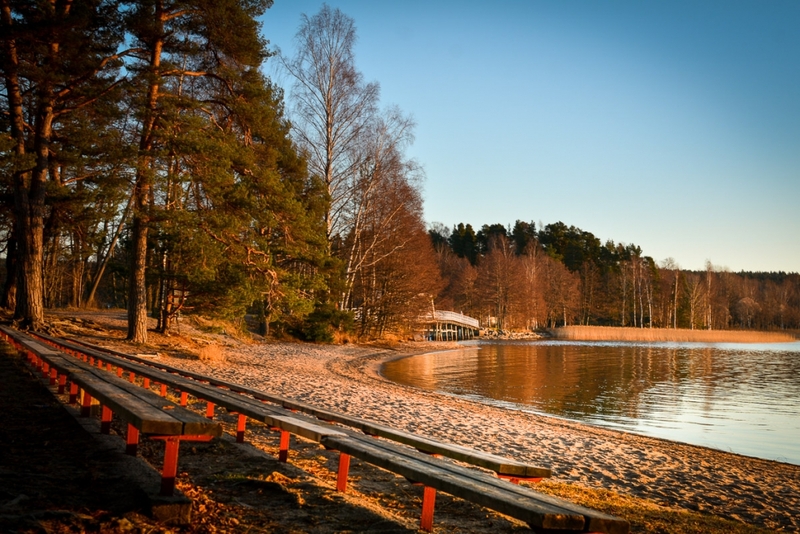 Less than an hour’s drive from Helsinki, the city of Lohja offers you a good glimpse into the nature of Southern Finland. 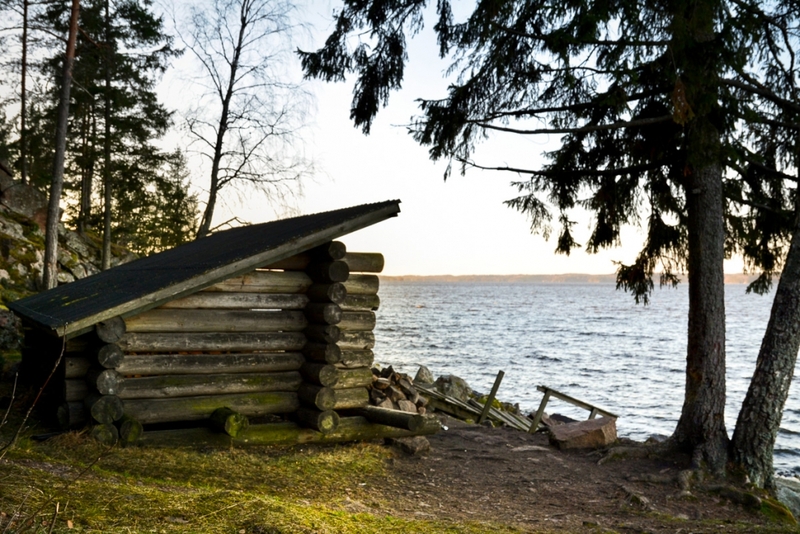 One of the most popular outdoor destinations in Lohja is the Liessaari Island. 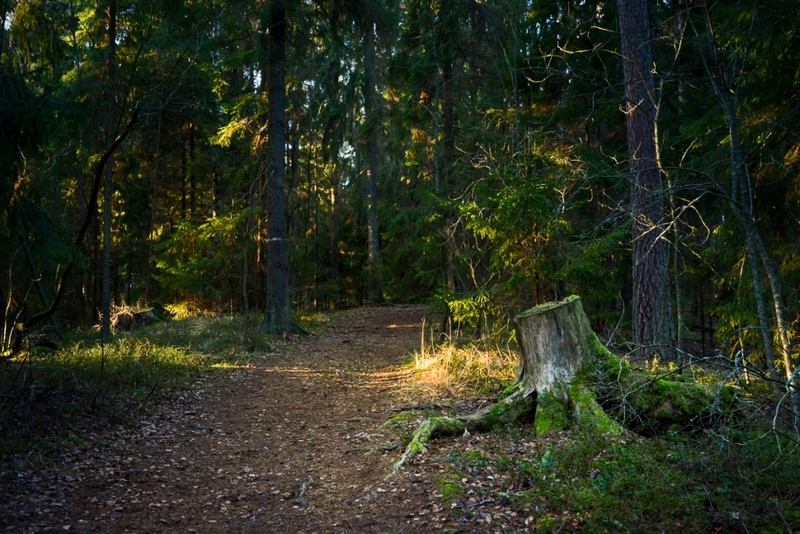 The magnificent nature trails of the island invite you to explore them in an easy way. 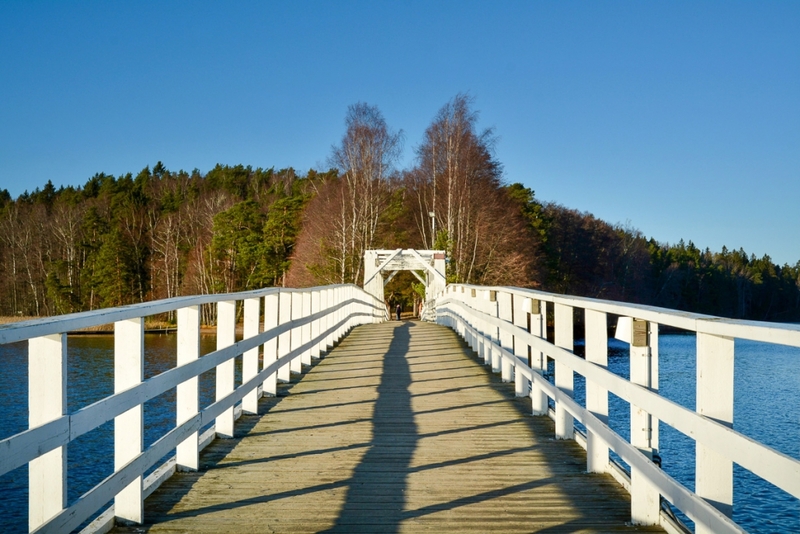 Few kilometres away from the centre of Lohja, there is a white wooden bridge stretching across the lake to the island of Liessaari. Loved by many, the bridge has appeared in thousands of photographs, and the long island, equally cherished as a local jewel, will offer you much to explore. 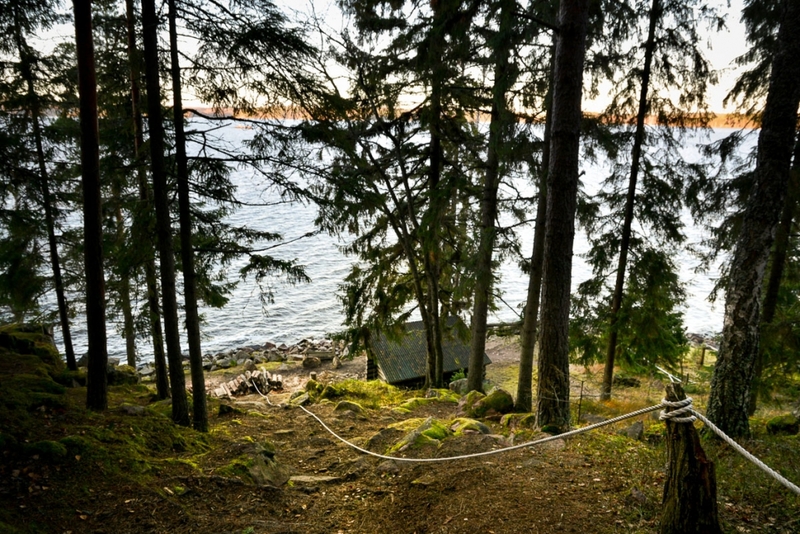 On the island, there is a special wellness trail, nature trail, beach and a lean-to. 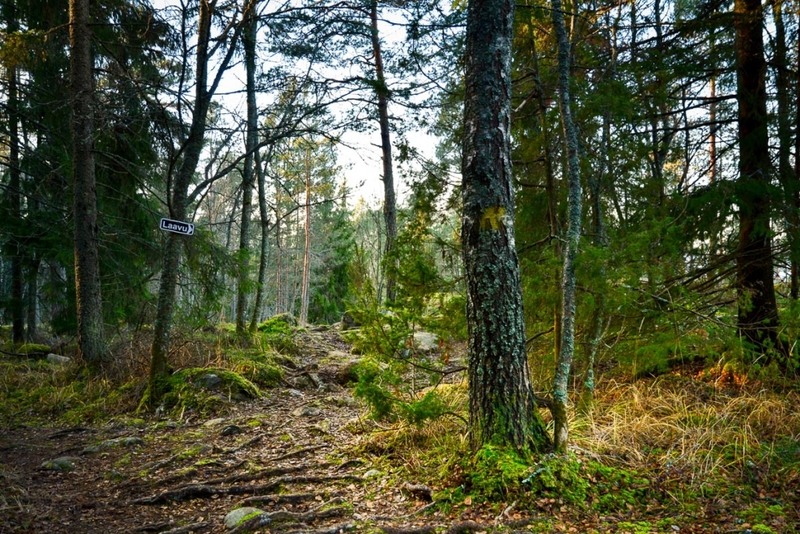 The Liessaari Island is a great place to visit with kids, and some of the trails are accessible even with prams. If you are coming in from the centre of Lohja, you can hop on to the bus to Virkkala, and hop off at the Haikarinkatu bus stop. That leaves you a 1 km walk to the island. If you are travelling by car, you can park it on the parking lot just by the bridge. If you do not have your own car or if you want to go green, you can rent an electric car from the city of Lohja. Instructions in English are found at the bottom of the page. If it is summer and you are arriving by a boat, you can leave your boat on the guest pier of Villa Haikari a few hundred metres away. I am strolling on a wooden bridge with a smile on my face. Although it’s November; said to be the darkest and gloomiest of all months here, the sky is completely clear today. The lake shimmers in the sun, and the reeds bask in the yellow light. Once I cross the bridge, I am greeted by the tall pine trees. 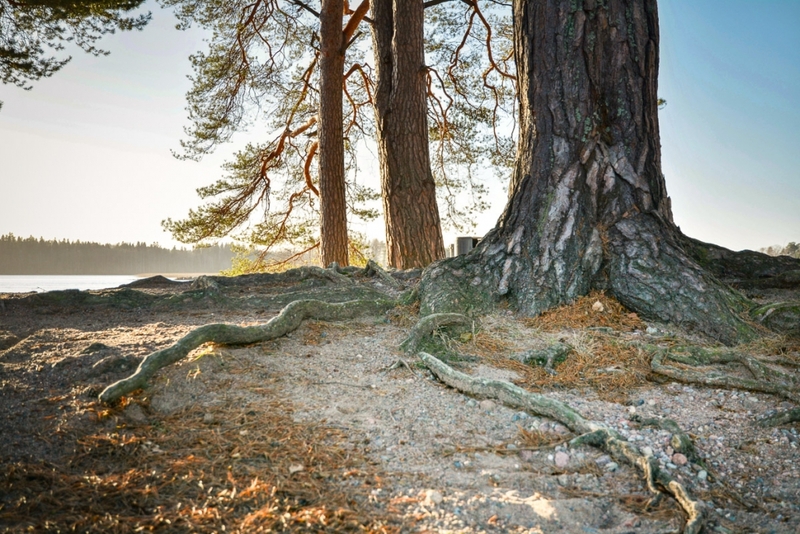 Their roots extend like giant toes in the sandy soil. 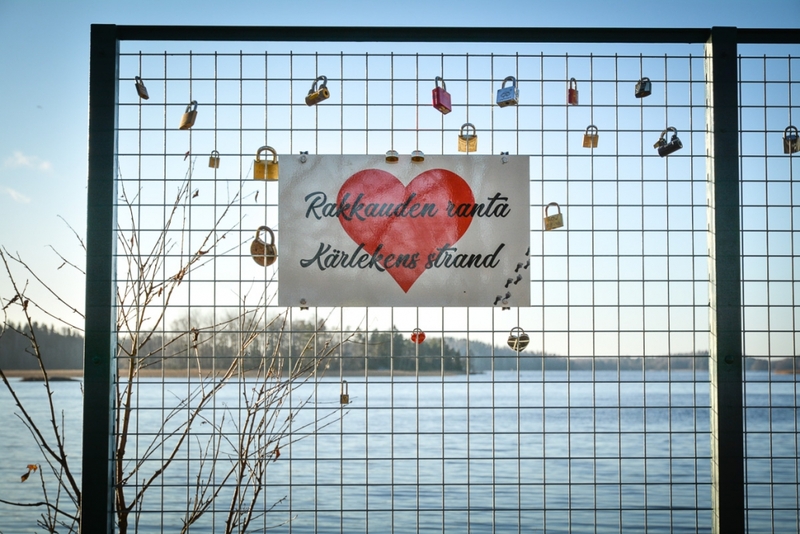 Right next to the pines there is a small metal fence with love locks and a sign that says “Beach of Love”. I stop to study the map of a wellness trail. The trail goes around the island for 2,4 kilometres. The map is carved in a piece of wood and attached to a thick dead tree. Along the wellness trail there are several checkpoints that contain small tasks. The tasks provide a good and fun way for learning more about the nature of the island and the wellness experience nature bestows. Unfortunately, the checkpoints are in Finnish, but if you have a local person with you, you can ask them to translate the instructions for you. The wellness trail is marked on the grounds with wooden Luonnontie tags which don’t stand out much. The wellness trail is partly shared with an old nature trail, which in turn is marked with blue pine cone signs. 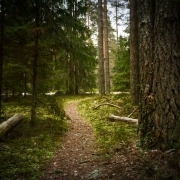 Be careful in places where the trails cross if you wish to stay on the right one. 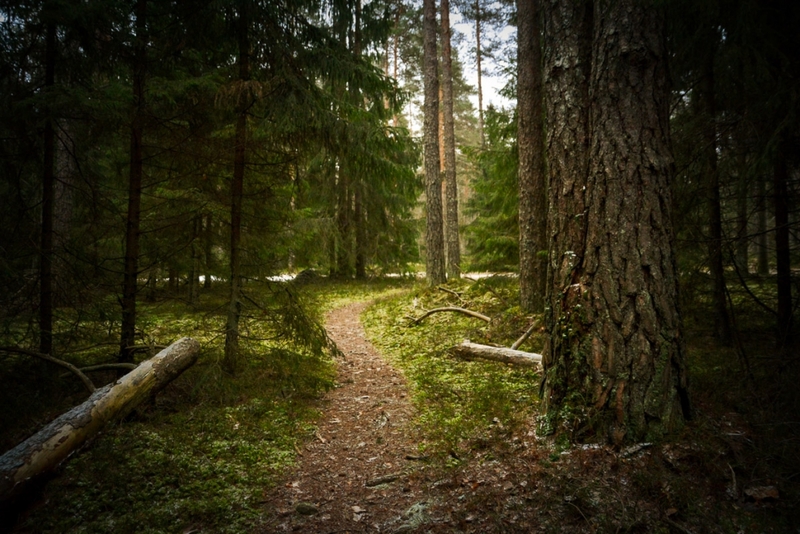 Don’t worry, though, because you will not get very lost even if you inadvertently take the wrong path. The map guides me to start my journey at the wide trail on the east side of the island. Large black alders stretch their trunks and branches over the water. The city of Lohja is visible on the opposite shore: I can see the high-rises and the chimney-stacks of the factories. 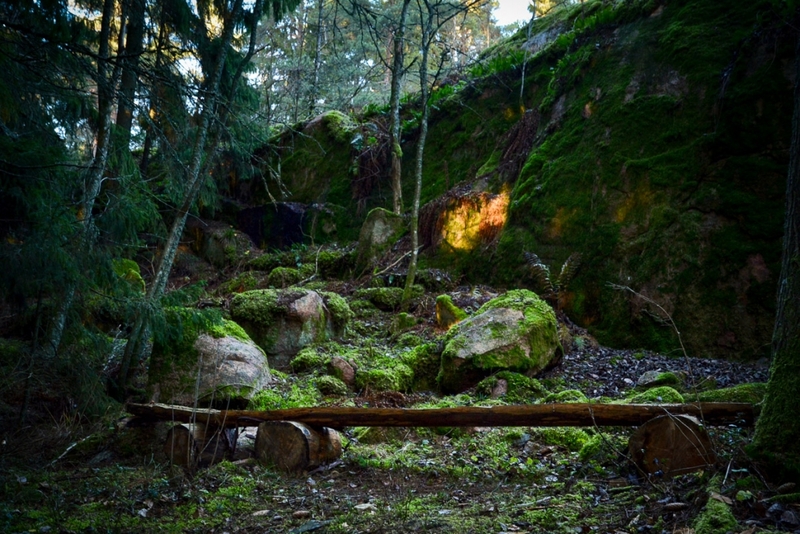 The trail is bounded by decaying trunks covered with mesmerizingly green moss. 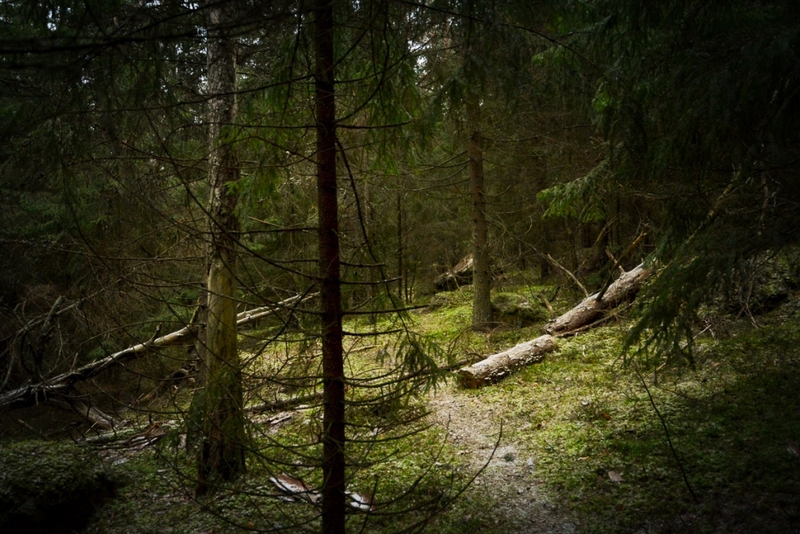 When I walk further, I spot a steep slope on the left, and a rope leading up the slope. That’s one checkpoint along the wellness trail. The idea is to climb up the slope with the help of the rope, and come back down. The children love this task, and there’s no shame in trying it if you’re an adult, either! The rope task is a fun way to get your energy flowing for the rest of the trip! Soon the trail starts to go uphill. 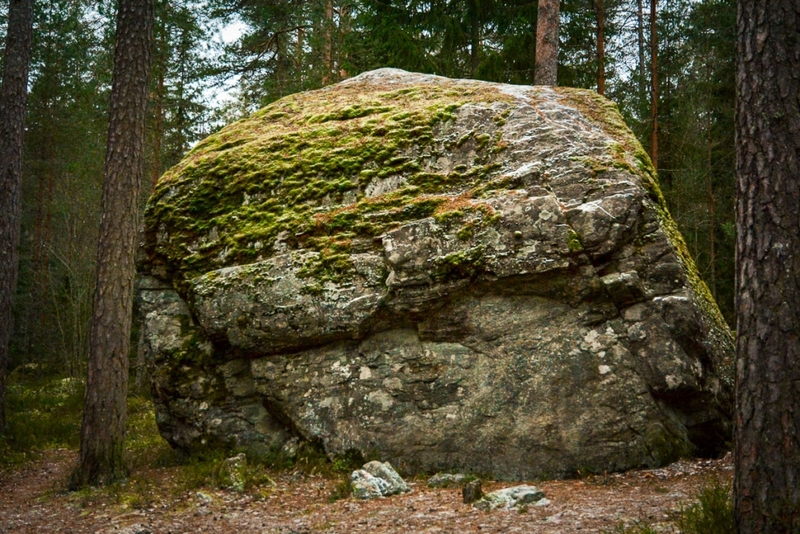 Up on the cliffs, I find a large erratic; a remnant from the Ice Age. There is another checkpoint and a task that asks me to whisper my worries to the erratic. 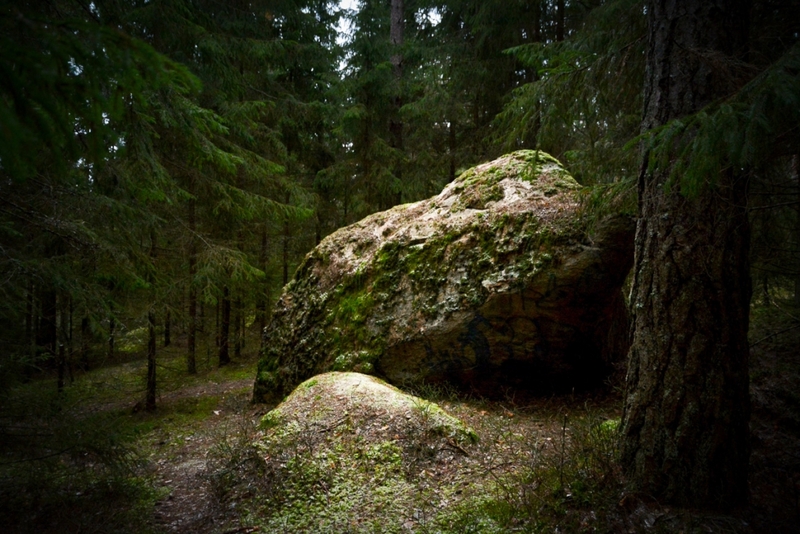 The erratic listens to my whispers silently and steadily as ever. I glance over the Lake Lohjanjärvi, but I don’t want to rest longer yet. Soon, however, I have to. Just a few more turns further, and I find some wooden benches on the clifftop. Finally, I can take the load off my legs and have a cup of tea. There is something special in this place, something extremely relaxing. Right next to this place, lies one of the two discontinued granite quarries of the island. If you are not afraid of sheer drops, you can go and take a peek at the quarry, safely behind the balustrade. I move on, enjoying the sunlight filtered through the trees. 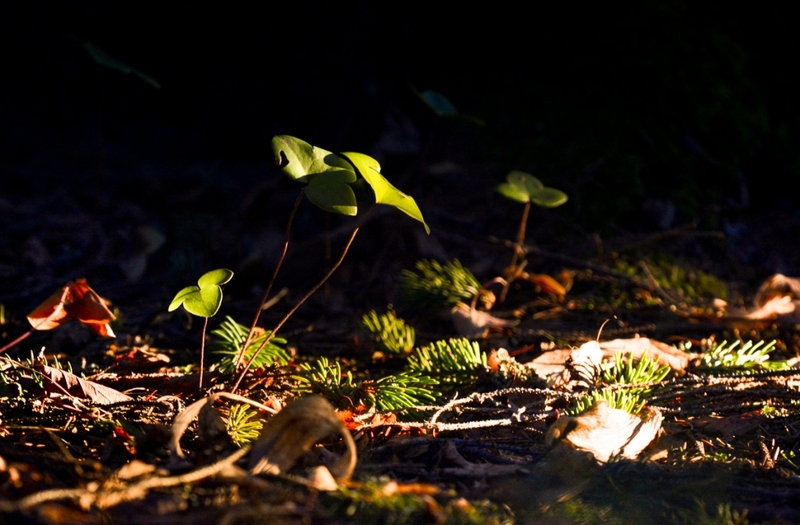 There’s something fascinating about the light in November. It is both golden and cold at the same time as it is both sharp and soft. 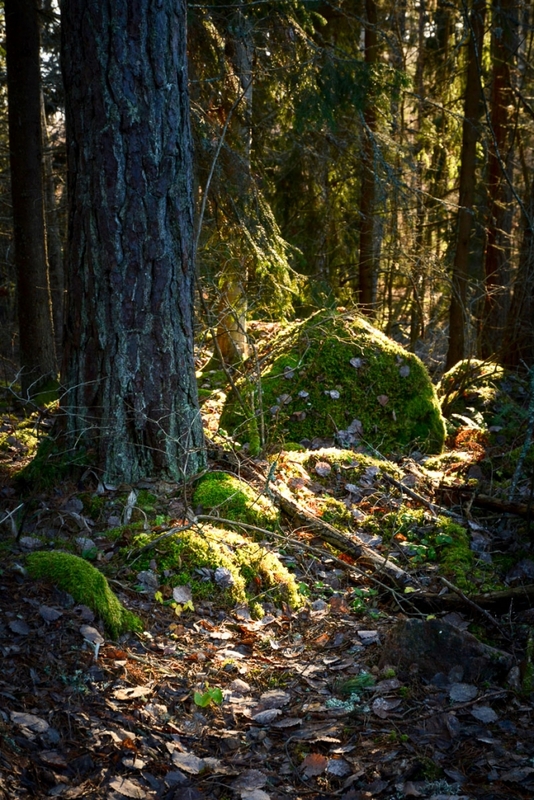 The light creates deep shadows that accentuate the features of the landscape. 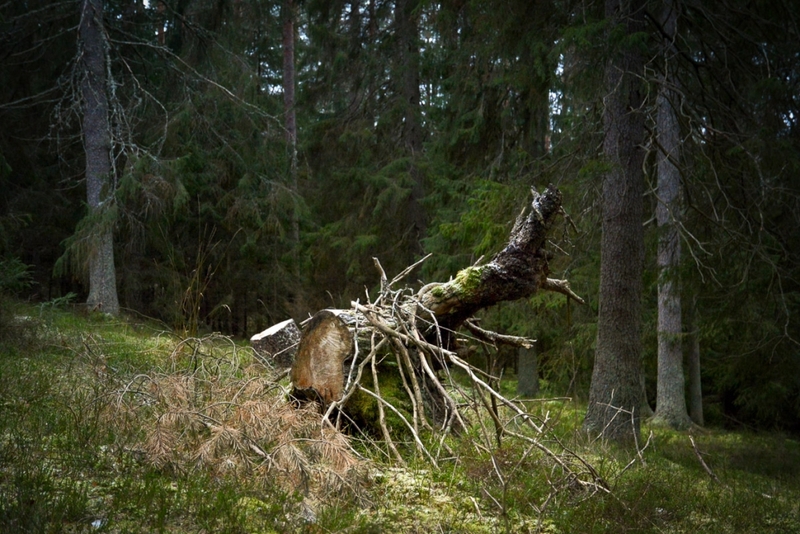 The trees in the forests of Liessaari are also wonderful; unattended they grow in many places, stretching here and there, taking their own space and time. 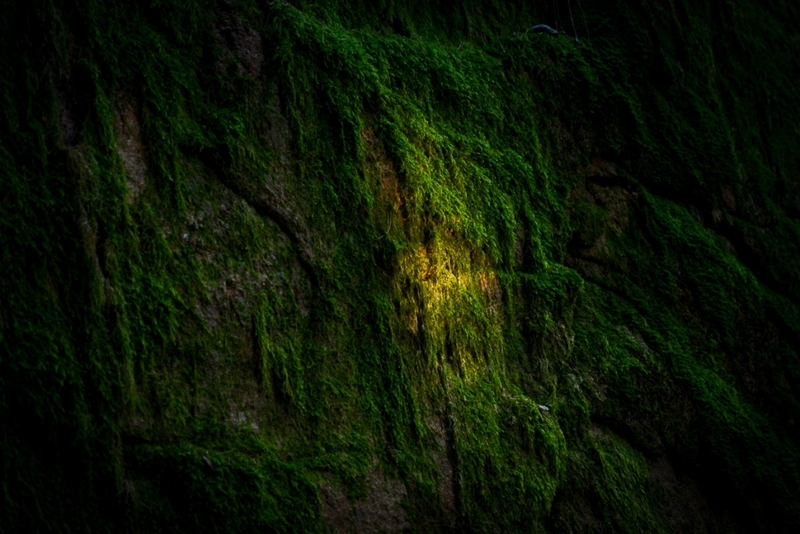 I marvel the cliff face covered in thick, deep green moss, and lie down on a wooden platform built here beside the wellness trail. I look at the treetops and close my eyes for a while. I would have no trouble in falling asleep. After I’ve moved on again, I come to a crossing where the wellness trail turns back to its origin. I don’t want to go back yet so I choose another trail that leads to a lean-to in the western part of the island. That will add almost 3 kilometres to my trip, but I am not in a hurry. 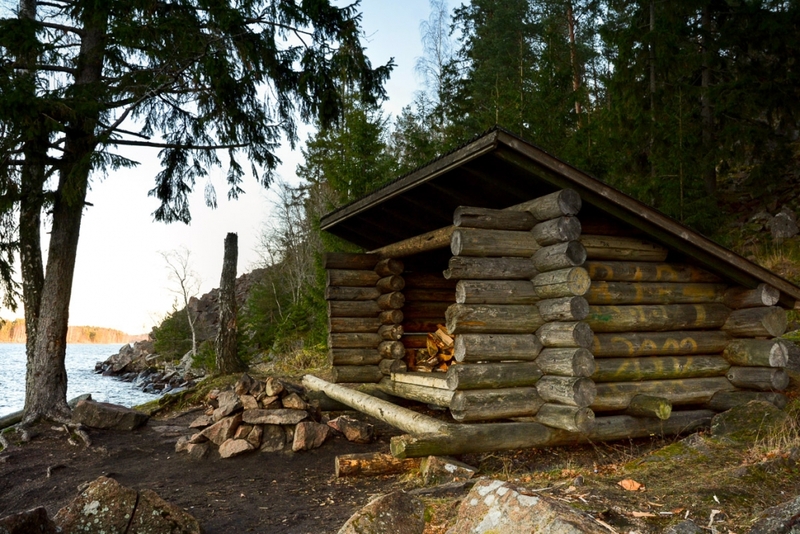 The lean-to is located at the north shore, under a steep and rocky slope. A rope has been set there to help the climb up and down, and I use it gladly. I can see smoke coming from the campfire site. There is a family there roasting sausages. 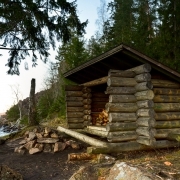 The lean-to is a popular place for short weekend trips. I meet several people going to or coming from the lean-to. There’s a shed for the firewood on top of the hill. You might want to grab a few logs with you before you go to the lean-to. That way you can cut off an extra trip to the woodshed. Please put out the fire carefully when you leave if there’s no-one else at the lean-to after you. On my way back I pace myself a little to beat the sun before it sets beyond the horizon. Still, I can’t help stopping every now and then to gaze at trees stripped bare by January. 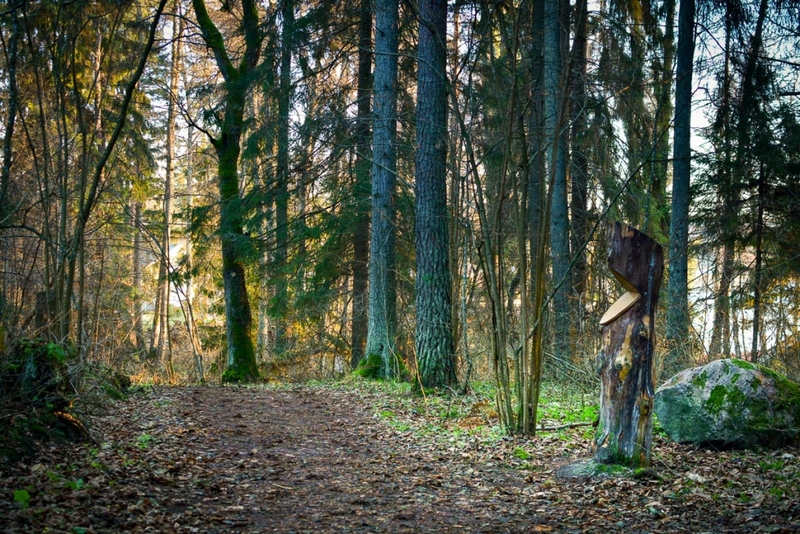 One particularly wonderful detail is a robust tree stump made look like a throne in the woods. I wonder, how long has it been there? When I reach the point where I started, the sun shines barely on the sandy beach by the bridge. The temperature has fallen below zero; not much but enough to make my nose and cheeks tingle. 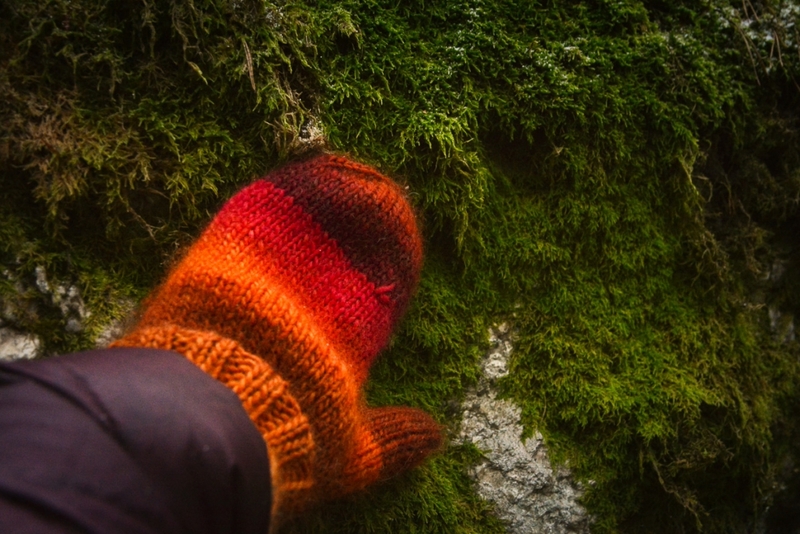 I have spent a few hours in Liessaari, explored its forests and cliffs, and I feel totally happy and relaxed. 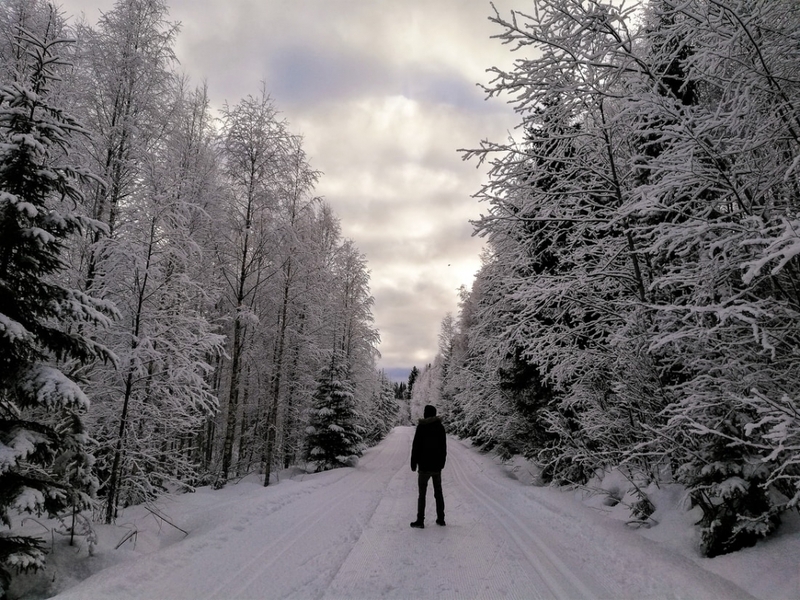 After 3 months of being on student exchange, the time had come for me to embark on a long-awaited Christmas adventure to snowy Finnish Lapland. This experience is literally the polar opposite of what it’s like in my home country, sunny Australia. I was especially looking forward to the untouched nature and of course the elusive northern lights. 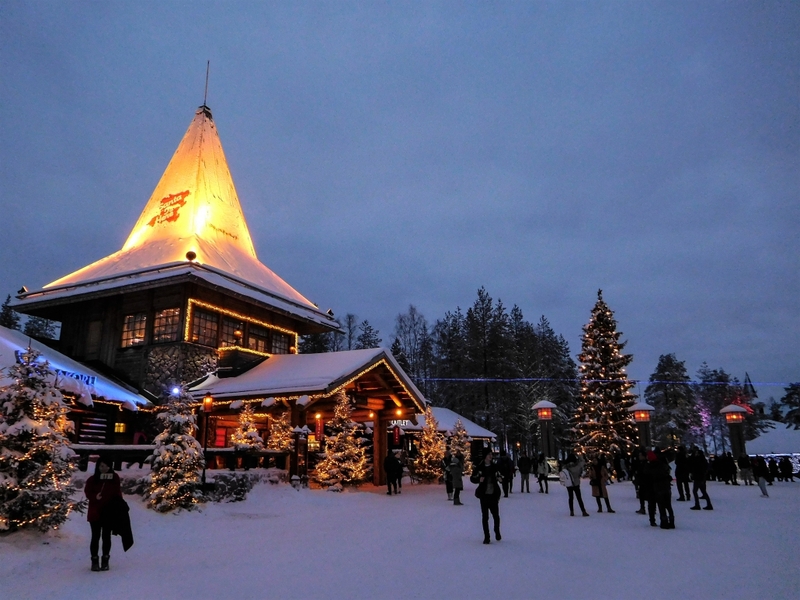 On the long bus journey, we stopped over at Santa’s village in Rovaniemi and walked across the arctic circle. It can’t get any more Christmas vibe than this! After over 12 hours of being on a bus, my group finally arrived at the pine-tree filled winter wonderland that was Saariselkä. We were staying in a rustic wooden log cabin complete with a fireplace and sauna. 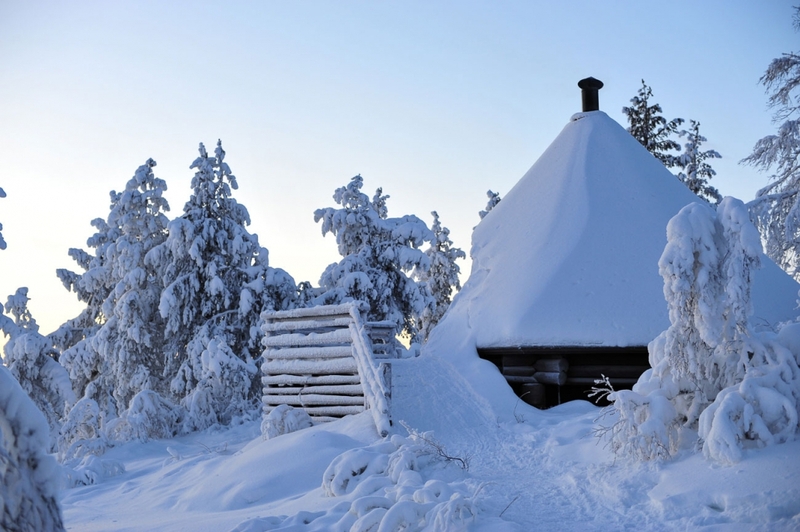 Picturesque log cabins are where you can expect to stay at in Lapland. There was fluffy snow up to the knees everywhere. 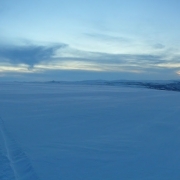 Being above the arctic circle, this time of year is the polar night, where the Sun does not rise for several weeks. However, there were about 3 to 4 hours each day with twilight conditions. Being an avid aurora-chaser, it makes for an ideal opportunity to catch a glimpse of the northern lights – if only the clouds stay away at night. The local area around where I was staying… so pristine and natural. Beyond searching for the elusive northern lights, this place was an amazing location for a wide variety of activities that I tried, including husky-sledding, snow-shoeing, skiing, sauna, ice-swimming and of course nature photography. It was especially great to meet some husky puppies. 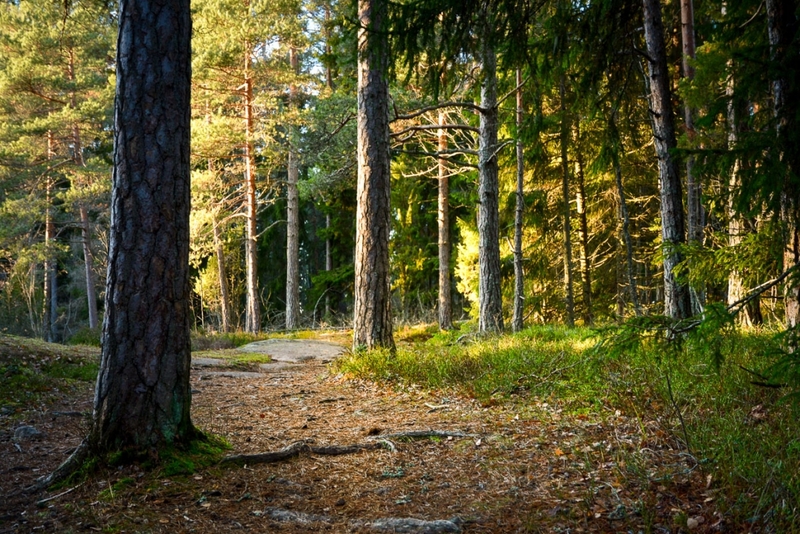 But more than anything, it’s a place to wind down and take in the quiet and fresh air of the nature on short walks. It was indeed one of the most peaceful places I’ve ever been. 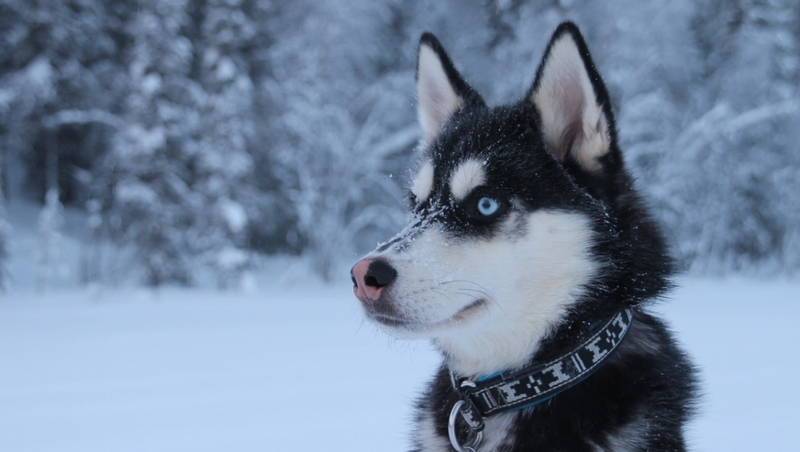 I actually have a very funny story to tell about my phone whilst husky-sledding. After my turn on the sled was complete, I realised my new Finnish Nokia smartphone had fallen out of my pocket (duh!) and into the snow somewhere in the arctic wilderness. After lunch, the tour guide and my friends decided to make a search party. Walking through the snowy wilderness in the fading light conditions at 2pm, there seemed to be little hope, but the untouched and silent nature was just surreal. Suddenly, at the very end of the journey we found just a tiny bit of the phone sticking out of the snow. It was basically a block of ice. But it was still on! And to my great surprise — still at 75 percent battery. 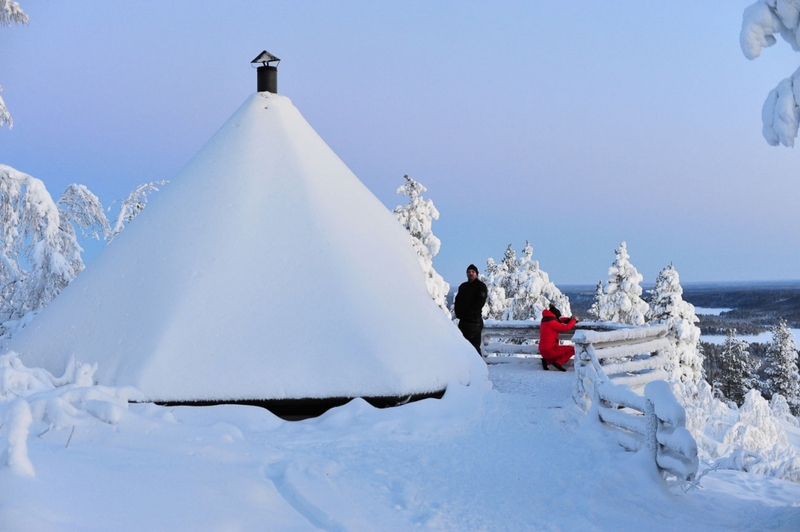 The next thing to do is typically Finnish — to take the phone to the sauna so the ice can melt. And this plan worked! Because afterwards it was working perfectly fine. 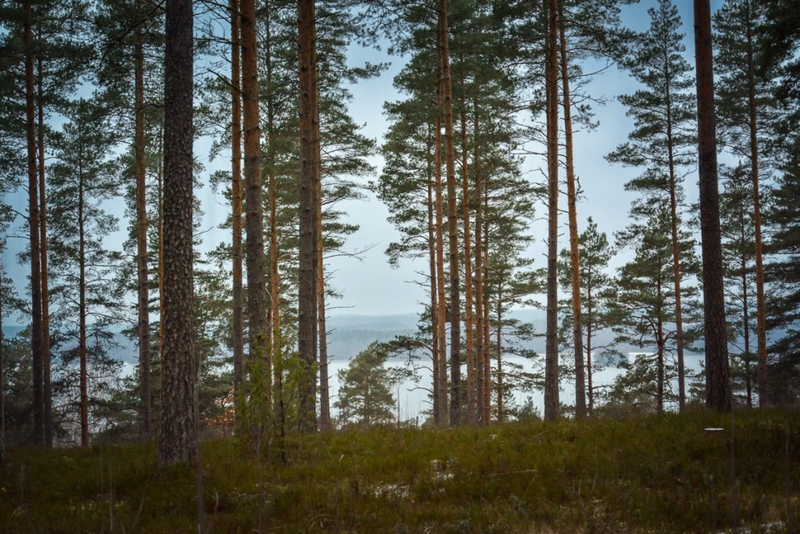 Lapland with its photogenic forests. On the first night, I was most eager to see the northern lights. There were good geomagnetic conditions for aurora, so it was promising. That’s until I stepped out of the warmth of the cabin to see that the sky was mostly full of cloud. Nevertheless, I went outside as there was a few gaps where I could see a star or two. After walking around the village and shooting photos without luck for over an hour in -10 degrees, it was time to head to bed. Then I awoke suddenly to find my cabin-buddies announcing that the northern lights would be visible soon! Half-asleep, I looked out the window to see nothing. I thought the window was facing north, but it was actually facing south, a mistake that would bite me this night. I managed to find my compass which pointed me north, and by the time I got outside, there was only a very faint polar light show, with cloud rolling in again. The others who reacted faster saw a much better show this night. 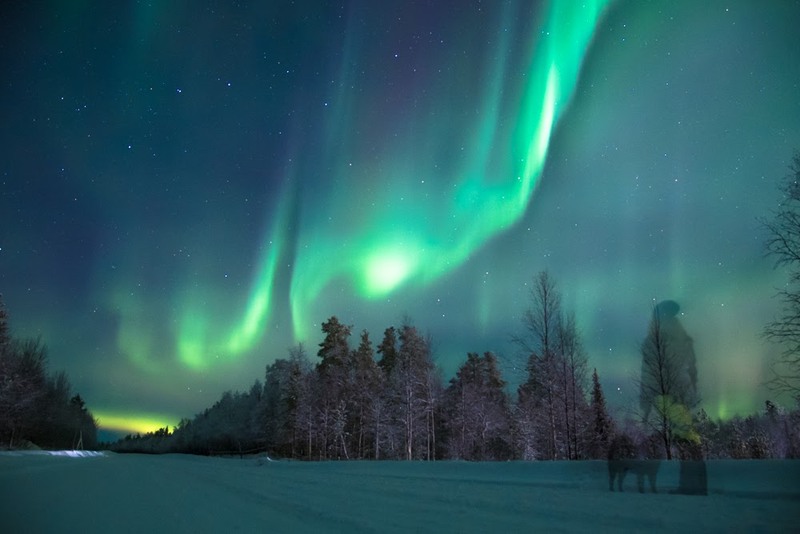 Finnish Lapland is one of the best places in the world to see the enchanting northern lights. Photocredit: Jonna Saari. The next night, in even colder and windier conditions, more luck was on my side, but only for a good twenty minutes. 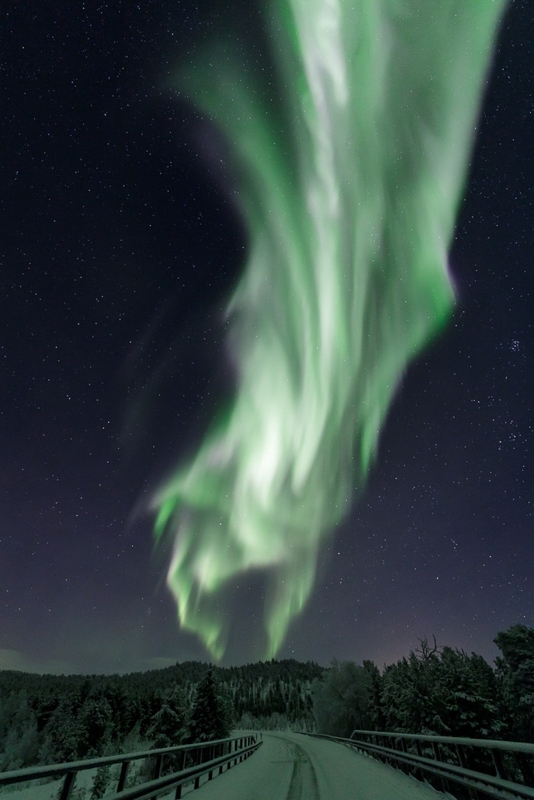 The skies cleared briefly just at the right moment to see a band of aurora flickering overhead and down to the horizon. I managed to get this photo before it clouded over again. No matter how many times I have seen the lights, or how impressive they have been, it is always immensely exciting! 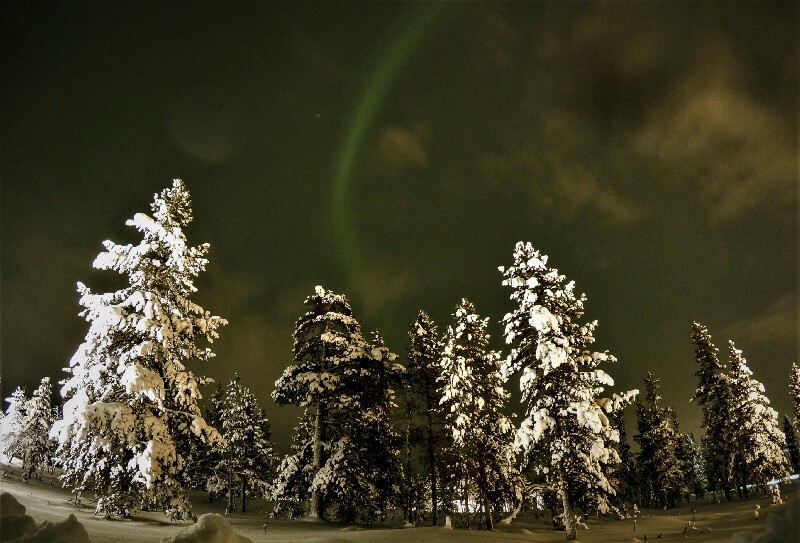 A brief show of the northern lights in the forested fells of Lapland in the midst of the long polar night. The next night had even better auroral conditions, but it was cloudy and snowing heavily so there was no point of going outside. The following (and final night) there was a few hours of clear skies in the early evening, but the auroral conditions were so weak that only those on the aurora tours managed to see them, and only briefly. Though I did hear of a couple who got engaged as soon as they saw them! That’s definitely a Christmas to remember for them. And for us, it was for sure an adventure to look back on! 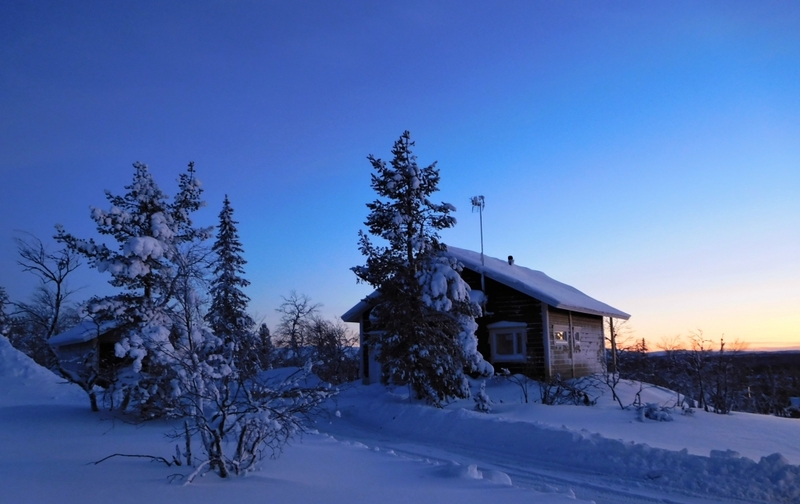 The blue twilight hour falls relatively early in the afternoon at this time of year in Lapland. 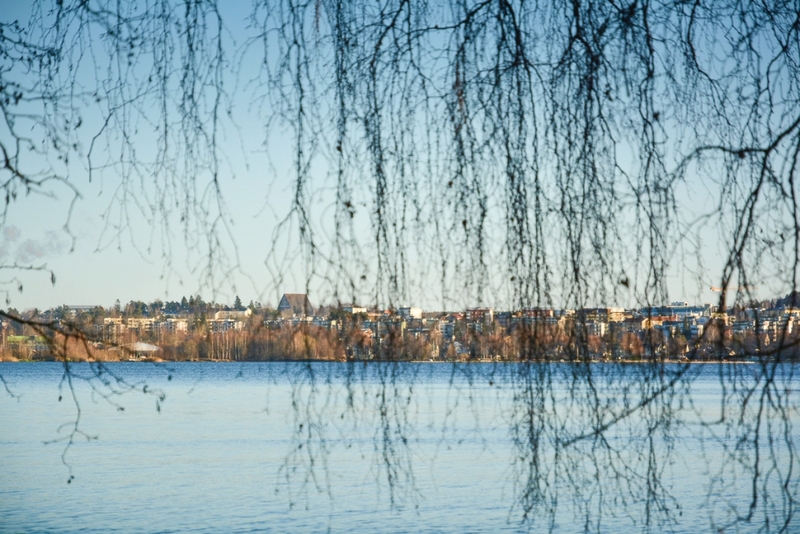 Our flag is white and blue, and so is our nature – happy Independence Day Finland! On December 6 Finland celebrates 101 years of independence. Happy birthday Finland! On the flag of Finland there’s a blue Nordic cross on a white background. 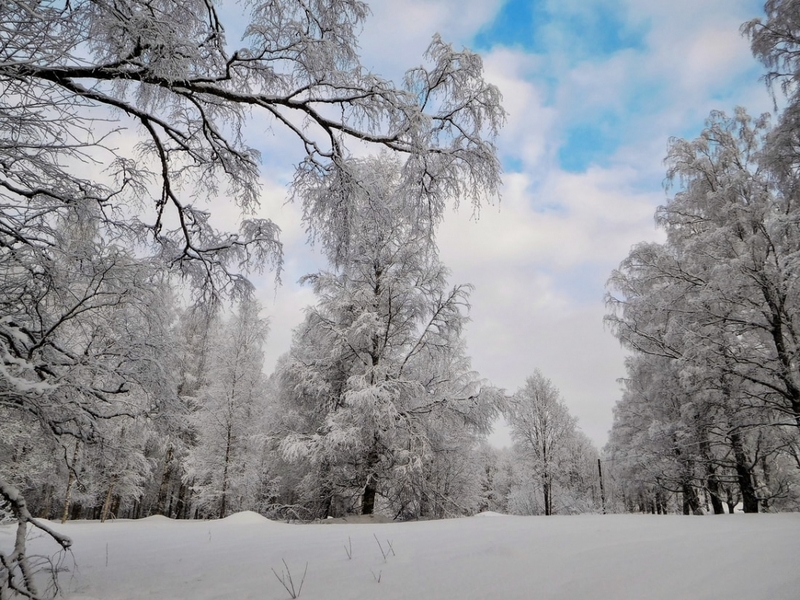 To show you how blue and white our nature can be, here are some photos that I have taken over the years in Lapland. Enjoy! Reindeer in Utsjoki, Lapland. This photo was taken on March 2015. 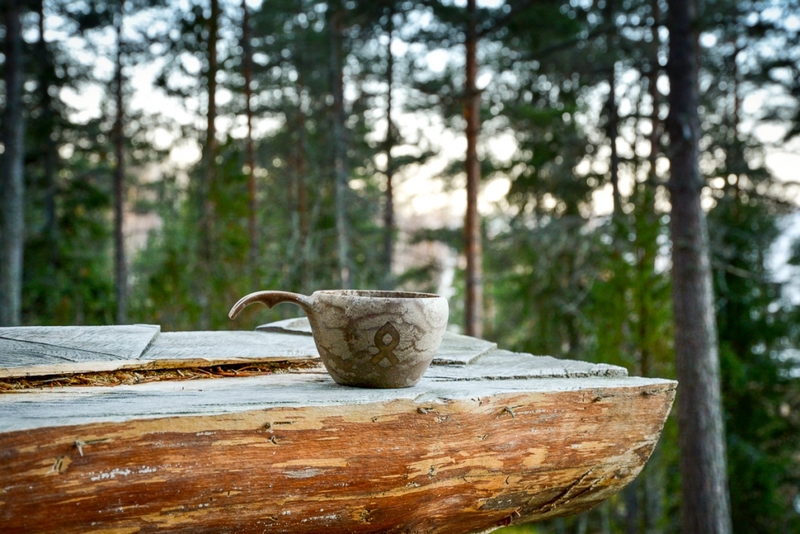 A woman drinking water from a stream in Muonio, Lapland. December 2015. 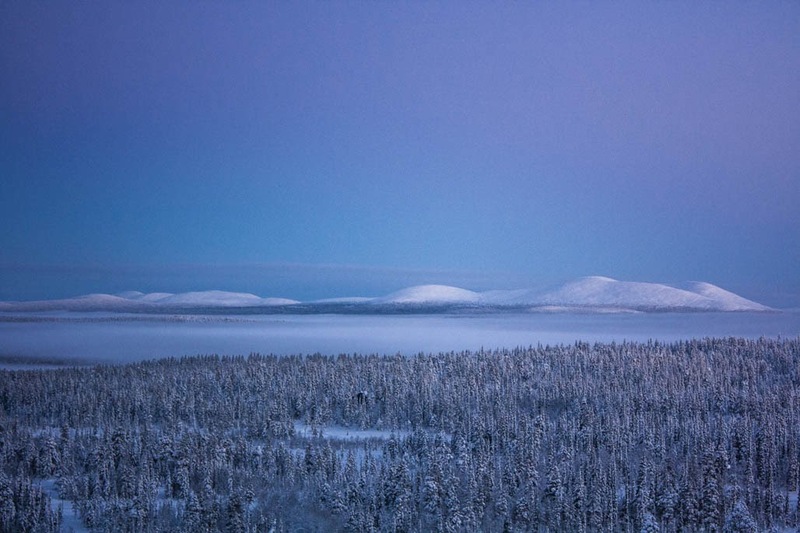 Pallas fells photographed during polar night in Muonio, Lapland. December 2015. A café and some snowy trees on the top of Levi fell in Kittilä. January 2016. Watching auroras in Kittilä. December 2016. 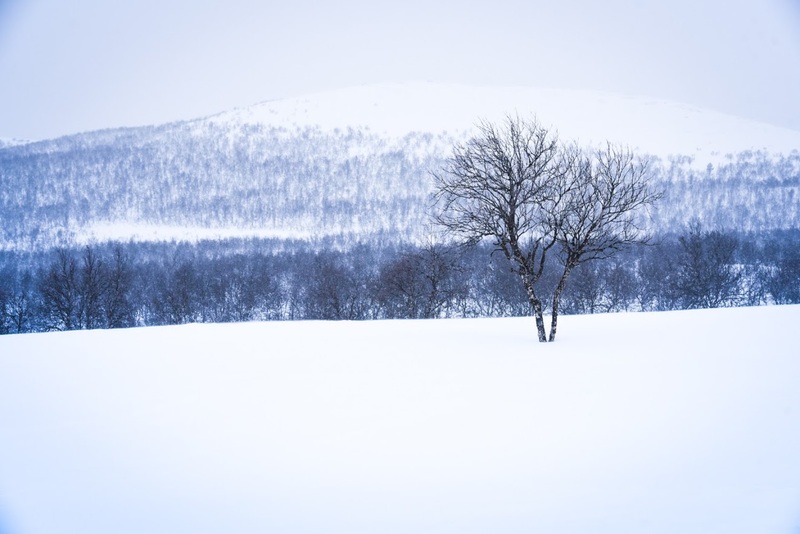 A birch forest in Utsjoki, Lapland. February 2017. Perfect silence. 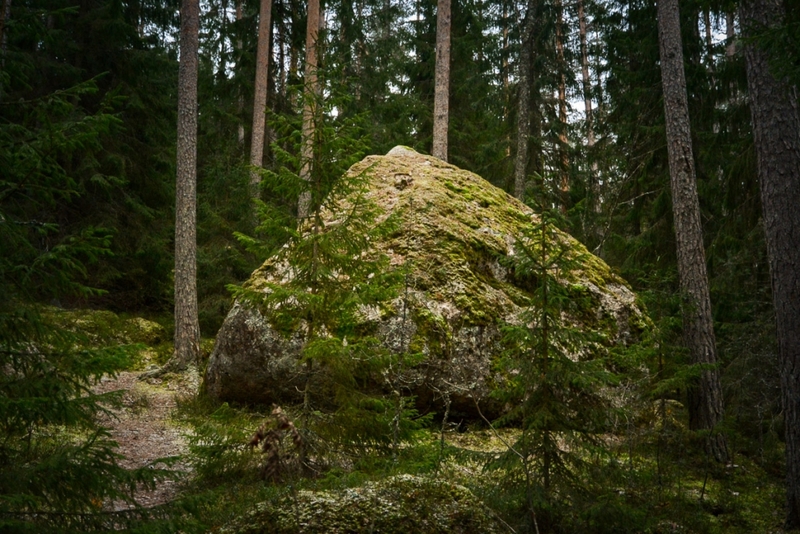 Sompio Strict Nature Reserve, Sodankylä, Lapland. December 2018. 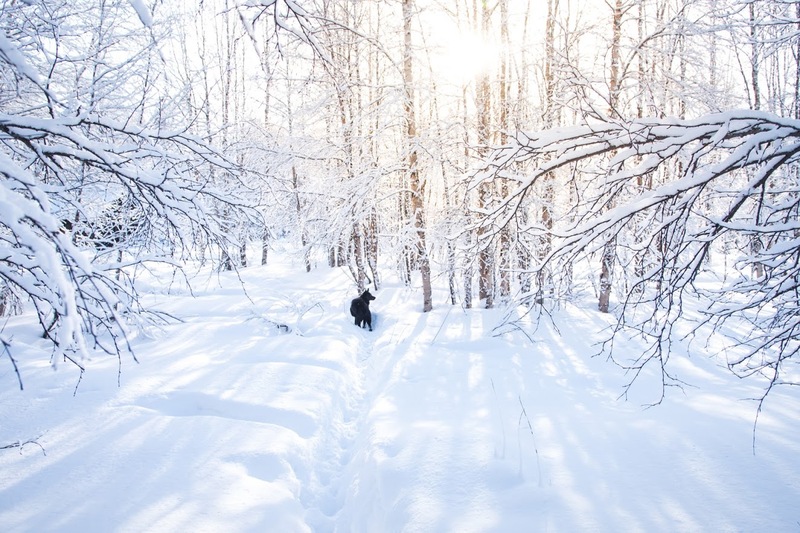 Black dog in a white forest. March 2017. 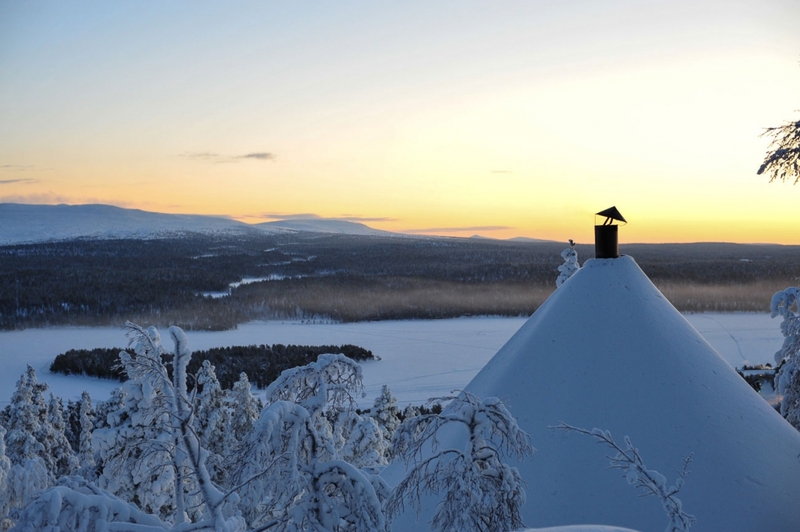 A view from the top of Kaunispää Fell in Inari, Lapland. March 2017. 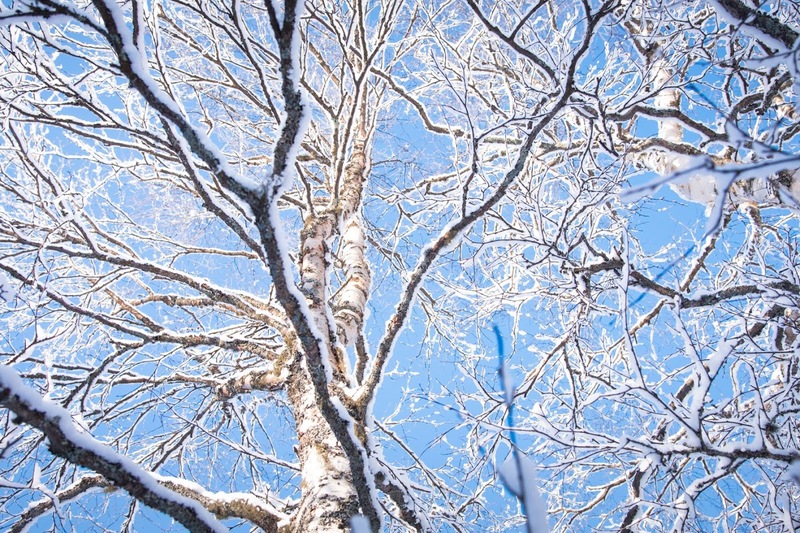 Snowy birch in Sodankylä. 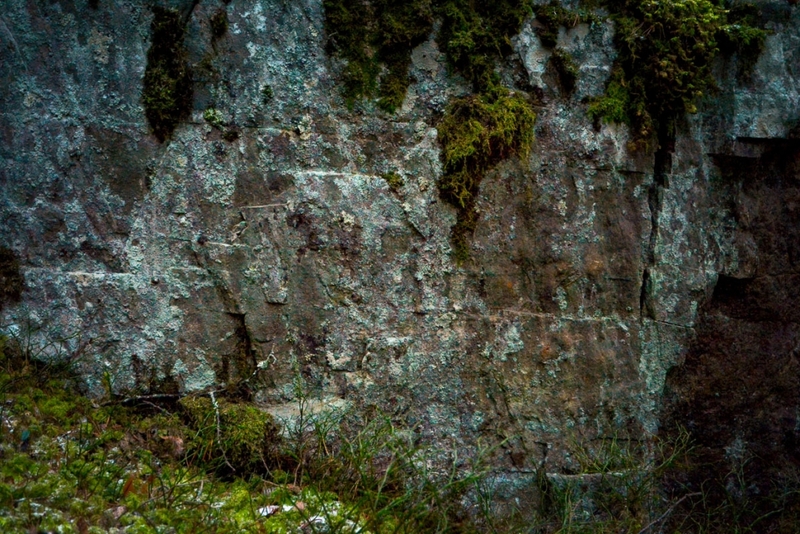 March 2017.
https://finlandnaturally.com/wp-content/uploads/2018/12/teno.jpg 594 1470 Jonna Saari https://finlandnaturally.com/wp-content/uploads/2016/08/finlandnaturally-logo.png Jonna Saari2018-12-05 13:16:452018-12-05 13:18:38Our flag is white and blue, and so is our nature - happy Independence Day Finland!